It’s become a cliché to refer to “mental health days”, those days when you don’t work, relax, work on yourself in whatever way you want[i]. A day of Netflix and sleeping, perhaps, or doing activities you don’t always have time for. Many of us have used the phrase, but not all of us have really digested what it means and the actual scientific and psychological good it can do for overall well-being. There’s great value to taking your mental health as seriously as you’d take any illness. Psychological well-being and a healthy mind don’t always have to be heavy topics. In fact, it’s often best if they aren’t. For many of us, the best treatment for a stressed mind is to pursue a hobby or an activity we’re fond of. Maybe a day off is a good time to catch up on reading, or work out, or just binge a TV show we’re further behind on than we’d like to admit. We often forget about the value of artistic pursuits in a world of demands and tight schedules. Work and play are meant to go together in doses, but we often neglect one in favor of the other. Such are the demands of the modern world that we don’t have time for everything, and must prioritize our days around what we need. Insert the mental health day. It isn’t weak to work on yourself, your emotional and mental health, or your psychological well-being any more than it’s weak to work on getting over the flu. Overworking yourself can lead to exhaustion. It doesn’t always entail taking a day off from work—often it just means setting aside time for your own pursuits. 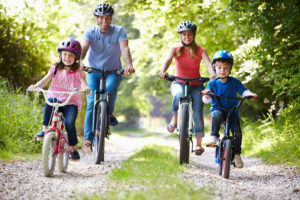 The weekend can be a great time for that, especially in spring and summer when we’re able to enjoy outdoor activities and the sun. Nothing rejuvenates faster than stopping to smell the proverbial flowers. Some of the other best things include getting a good night’s rest, which many Americans lack[ii]. Insufficient sleep is associated with numerous chronic maladies, ranging from diabetes and cardiovascular disease to high blood pressure and mood disorders[iii]. A day of sleep isn’t a bad idea in this case. Many of us enjoy the peace and quiet that come with full rest, and if it has physical benefits as well, then the more the merrier. Other beneficial suggestions include socializing, especially with other friends who could use a meaningful connection, or have their own mental health challenges and would appreciate the reach-out. In a constantly-wired world, sometimes unplugging and having old-school communication can switch up your paradigm. We like pleasant changes that accent our days, and having positive outlets like friends is one of the best things we can use[iv]. Other common suggestions include eating healthy and exercising. These, of course, can help mental health tremendously. Exercise is well-known for its immense psychological benefits[v]. But sometimes it’s also rewarding to indulge in something purely for the pleasure of it, such as ice cream or chocolate. Don’t worry about that last one—chocolate, specifically extra dark chocolate, seems to also be good for your brain, in the right doses[vi]. Moderation is the key to everything, including the things we love. The real point of all this—and mental health care in general—is to just set aside time to do the things you love. If it makes you happy, try to fit it into your day, or find a day when you can pursue it the way you want. It’s an excellent way to depressurize yourself, focus on personal well-being, and not only positively influence your own health, but the health of those around you. A good mood can be contagious, and who doesn’t want their mental health improved to the Next Level? Especially, of course, if chocolate can be involved. It’s an exciting time for mental health treatment. You may have heard, but in the past six weeks, the FDA has approved new medication for treating depression and postpartum depression. In the latter case, this marks the first time ever a drug has been approved and marketed specifically for that condition. The drug is an intravenous infusion called brexanolone, which will be sold as Zulresso. What makes the medication so notable is the speed in which it works—whereas conventional antidepressants can take days or weeks to have effects, brexanolone was shown in clinical trials to take effect within hours. That’s an incredible achievement, and a wonderful boon to new mothers, one in nine of whom suffer from postpartum depression[i]. The medication will become available in June. There are drawbacks, however. Zulresso was approved with a REMS (Risk Evaluation and Mitigation Strategy), meaning it’s only available to patients through restricted distribution programs at certified health care facilities. At these facilities, the health care providers can carefully monitor the patient for as long as necessary. Brexanolone is administered in a 60-hour IV drip, comes with side effects such as headache or dizziness, and, according to Sage Therapeutics, will likely cost around $20,000 to $35,000 per treatment[ii]. What’s truly unique about brexanolone is that there are no other FDA approved antidepressants for postpartum depression. This is a first of its kind. There will undoubtedly be further developments and exciting new treatments in the future, but progress starts with a single step. Without treatment, postpartum depression can last for months or, sometimes, years. It can negatively impact the quality of life for new mothers and their infants[iii]. Treatments that alleviate that, and so quickly, are the goal of all mental health medication research. The other medication that was approved is called esketamine, a nasal spray used in conjunction with an oral antidepressant. It’s the first new treatment for depression to be approved by the FDA in over thirty years[iv]. 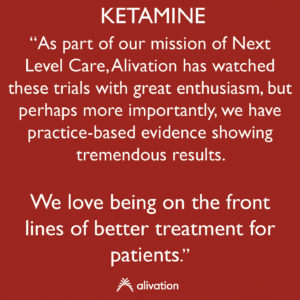 Alivation Health has been offering standard ketamine treatment for many years. Since the approval of esketamine, we’ve been asked about it many times. We are able to provide esketamine as a treatment option, however, since it is not covered by most insurance plans today, it is much costlier than the ketamine we continue to provide. Alivation is focused on working with insurance companies so that hopefully in the future, esketamine will be more widely covered. The two medicines, ketamine and esketamine, have not been compared to one another in large-scale clinical trials, but their effects are known to be quite similar. Neither have long-term addiction or habit-forming effects[v]. They both have excellent potential uses for treatment-resistant depression, making them very valuable to those suffering that condition[vi]. The future seems a little brighter for those suffering from depression. New treatments are being tested and studied every day, and occasionally, as has happened in the last few weeks, they’re also approved. Increasing varieties of treatment options and competition in this area may eventually allow prices to go down, and the patient will be the one benefitting the most. And that’s what treatment is all about. Yesterday was the twelfth annual World Autism Awareness Day, and all of April is World Autism Month. Delay and/or difficulty in learning language or lack of functional communication. Children on the autism spectrum disorder typically have some degree of impairment in communication. They may not respond to their name, initiate interaction with others, or demonstrate age-appropriate language development. Individuals with autism may often engage in repetitive body movements. Hand-flapping, tapping, spinning/rocking their body, or looking at things out of the corner of their eye. Marked impairments in interpreting and reciprocating non-verbal gestures. May demonstrate difficulties in identifying and interpreting various facial expressions and body-language such as foot tapping, stares, discomfort, raised eyebrows, etc. May focus on restricted interests. This can include preoccupation with certain topics or having things a certain way—like wanting to learn everything about vacuum cleaners or lining things up in a certain order. Lack of interest or deficits in developing and maintaining peer appropriate relationships and delayed development of social skills. As stated, while some individuals on the spectrum prefer solitude, many desire to make friends, interact socially but may lack the functional ability to do so (aka hidden curriculum). There has been some confusion about autism. While there are many questions about the genetic and environmental causes of autism, and much research in this area, we do know what likely doesn’t cause autism: the MMR vaccine[iv]. The only study ever to link the MMR (Measles, Mumps, Rubella) vaccine to autism was a small, fraudulent[v] study conducted by Andrew Wakefield that was officially and fully retracted by The Lancet, the journal that initially printed it[vi]. Medical researchers have stressed repeatedly that connections between the MMR vaccine, thimerosal, and autism are a myth[vii]. The American Academy of Pediatrics, so frustrated by this false, persistent link, has even compiled a comprehensive list of the many, many studies done testing the correlation—not one of which found any connection at all[viii]. Here’s what we do know about the causes of autism: it tends to run in families; there is an increased risk for it with advanced parent age (either parent[ix]); pregnancy or birth complications and pregnancies spaced less than one year apart may also increase the risk[x]. There are no bulletproof ways to prevent autism, but there are many treatment options available. Here’s what we also know about autism: it deserves support and compassion. It deserves your understanding and your knowledge. It needs your help to raise awareness about its complications, not only for the individual with autism, but also for the family and the caregivers. The disease can often be emotionally and physically taxing. Those with autism can struggle to integrate with other children or adults, or utilize social cues and skills. For many of us, we often take for granted what for others is an enormous challenge[xi]. 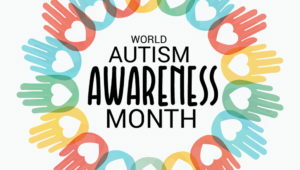 This year for World Autism Month, spread social media hashtags and articles raising awareness; read and learn about the realities of autism and what you can do to help. Understand the challenges those with it and those caring for others with autism face. As great a place as Alivation is, it’s still unlikely the team members would show up consistently if they weren’t paid. It’s no great secret to admit that. So: who keeps the payments running on time? It’s only one of his many varied duties, but Will is our Accounting Specialist and all-around data extraordinaire. 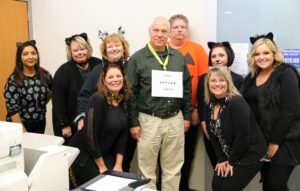 He runs our people payment programs, makes sure our benefits and accounting numbers are all correct, verifies paid time off, and then schedules them to run on specific days. In an organization of almost eighty people, that isn’t a small feat. And it isn’t Will’s only job. He spends a good part of his week running data analysis on Alivation’s trends. When do we see the most people? What are they seeing us for? What’s the average cost of a visit? What services do people use the most? Extrapolating from these trends allows the company to forecast where it’ll be a year from now, or a month, a week. Will often works in conjunction with Matt Duffy, his brother and Alivation’s Chief Strategy Officer. They consult with Dr. Duffy, President, Owner, and CMO, and Trevor Bullock, CEO, about what they’d like to see, and then find the practical ways to implement that based on solid data. The process is math and numbers-intensive, but that doesn’t scare Will away. To the contrary: he loves numbers and has an unquenchable curiosity about math. He started in pre-med but decided it wasn’t the right path. He once took an impromptu road trip from California and then to New York City; he ran out of savings, but he learned the importance of planning and financial responsibility from it. 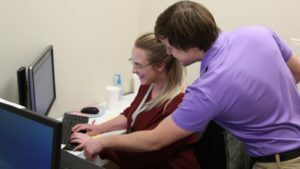 He started at Nebraska Wesleyan, transferred to Southeast Community College, and finished his degree from UNL in Business Management and is currently pursuing his advanced education in data science and analysis. Even while in school, Will worked 40 hours a week, often at Alivation Health (then Premier Psychiatric). There’s an underlying motive to Will’s work: he’s always desired to do the most good with what he has. Having his own mental health challenges in the past, seeing the effects of bad care and trauma, and losing friends to suicide has driven him to find his niche. 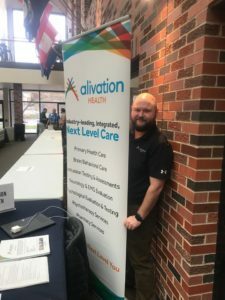 At Alivation Health, he’s part of something bigger, and has the passion and drive to serve the community he loves so much. 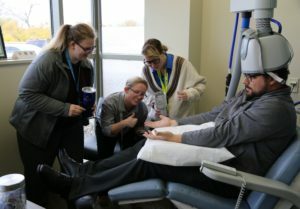 He sees the positive effects the organization has on friends and family, and the way Lincoln is served by having compassionate, innovative care. It’s a moral imperative for him. On top of that, he loves working closely with his family. When not engrossed in numbers, Will is often found biking one of Lincoln’s many excellent trails, or practicing meditation and yoga to increase his mindfulness. Though he loves the time he spends at work, he is always happy to go home to his wife Sadie and their dog. His favorite thing to do is listen to podcasts, usually about economics or brain health. It’s common to pass his office and see him with his headphones on, engrossed in Excel and learning from a Ted Talk at the same time. He’s a stickler for saving. Will remains mindful of his personal expenditures with the same diligence as his job. He now loves stability. You won’t find him suddenly taking a road trip to California with friends anymore—he’s learned since then. He now hunts for the best deal, plans months in advance, and is conscious of the expenditures. An organization is only as good as its people, and Will goes above and beyond to ensure everyone is happy and paid (they go well together). He’s an integral part of what Alivation Health is, and what it can be for the community. He forecasts good things for the future, and thousands more coming through our doors for their Next Level. A quick look through Google’s 2018 search trends yields interesting, if predictable, results. Among the most searched were Anthony Bourdain, Kate Spade, and Mac Miller[i]. It’s always easy to get morbid when reading the news and seeing a new celebrity has died, or in the case of Bourdain and Spade, that they’ve taken their own life. Mac Miller, still in his twenties, died from an accidental drug overdose[ii]. The debate between what is lurid or sensationalistic and what is factual reporting will not be solved here, but it’s still important to discuss the nature of framing mental illness and discussions around seeking help. There’s always a rush to conspiracy in cases with any unanswered questions. To outside observers, Kate Spade and Anthony Bourdain seemed rich and successful. Spade had a popular line of fashion accessories, and Bourdain, aside from being a well-known chef and television show host, was also a prolific writer of several books. He seemed always busy, jet setting around the world to exotic locales and dining with other wealthy famous people. How could someone like that ever contemplate suicide? Something seemed amiss. At least, from a traditional point of view. In the light of what we now know about mental health, neither case is particularly strange. As hard as it is to believe, even the rich and famous can have major depression. Pete Davidson, a current star on Saturday Night Live, has been very open about his ongoing mental health struggles over the years[iii]. These types of admissions go a long way in convincing people to look inward and talk about their own challenges. If there’s a silver lining to mass media reportage of mental health and celebrity suicide, it is certainly in the way it encourages people to question and think about the way their own psyches deal with potential disorders. Or in the way it gets us talking to each other at all. Of course, there is and always has been plenty of so-called fake news out there, or less than reputable sources peddling wisdom. For the average person looking to understand what makes someone contemplate suicide, or the psychological challenges that allow a mindset like that to develop, distinguishing between real and fake can be exhausting. We’re inundated daily with gossip, innuendo, cherry-picked facts and outright lies. Alternative stories often sell better than the real thing, which makes the temptation to indulge in it no surprise. Media is a business. So for the average person looking to understand—and from what Google tells us, it’s quite a few—what’s to be done? How do we make sense of something senseless? How do we talk about things that are so important and yet seem to lack a common language or understanding? We don’t give up, certainly, but neither can we trudge ahead with misconceptions and gossipy facts with only a side order of truth. Do we just turn on the TV and hope the pundit knows that they’re talking about? We believe, as always, that the cure is education. To understand the mechanisms behind not only suicide, but depression, anxiety, bipolar disorder, and a host of other psychological challenges, the trick is to learn as much as possible from reputable media sources. There’s Alivation, of course, and we’re happy to help. There’s also the Mayo Clinic resources, as well as WebMD. Johns Hopkins has a wonderful repository of articles and facts, all backed up by scientific studies and professionals trained in these disciplines. The Lancet, though often quite technical, also has great articles for a lay audience from time to time. The key is to seek out the purveyors of truth and then seek out even more sources to best be educated. Don’t settle for one source, use three; don’t take one person’s word for it, get a second opinion. If this sounds like a lot, just remember: it’s no more work than listening to the news disseminate information wrongly. For everyone you care about with these challenges, education is important. Understanding is equally crucial. Gossip won’t work anymore. Use facts. The National Suicide Prevention Hotline is 1-800-273-8255. They are available 24 hours, every day[iv]. We’ve heard these terms used interchangeably before, haven’t we? To most people, the difference between a psychologist and a psychiatrist is about the same as the difference between a turtle and a tortoise: we don’t know. However, just like those two animals (both reptiles, but in different classification families), the difference between psychology and psychiatry is well-known in the field, and an important distinction. The biggest difference between psychologists and psychiatrists is the treatment of their patients. Psychiatrists are medical doctors licensed to prescribe medications. Much of their time is medication management for treating their patients. Psychologists focus on psychotherapy, especially treating emotional and mental distress in their patients by using behavioral intervention rather than medication-based intervention. Psychologists are equipped to conduct psychologist tests to assess a patient’s mental state and help determine the most effective treatments. Another difference between the two is in education. Psychiatrists spend four years at medical school, train in general medicine, and after they earn their MD they practice four years of residency in psychiatry. Psychologists obtain PhD or PsyD doctoral degrees, which take from four to six years. Psychologists study personality development, the history of and case studies about psychological disorders, and they conduct psychological research, whereas psychiatrists often practice their residencies in hospitals and psychiatric units. Their work ranges from behavior disorders to severe mental illness in adults and children. The two professions are often integrated: after being referred by a primary physician, a patient may work with a psychologist to address mental or behavioral problems. If the problems are severe or lie outside the purview of the psychologist, they may refer this patient to the psychiatrist, who prescribes medication and monitors its management. Often, the psychologist and the psychiatrist work in tandem for their patients to pursue the best course of treatment. At Alivation Health, we’re strong believers in the integrated model. We don’t like a patient coming to see us from a primary physician and then getting the runaround, or stopping in for help only to be told they have to go back to step two and try again, or that we aren’t equipped to help them when they need it most. Going in circles doesn’t help anyone conquer their psychological challenges. As a result, we employ both psychologists and psychiatrists on our team. We currently have two Psychologists (PsyD.) 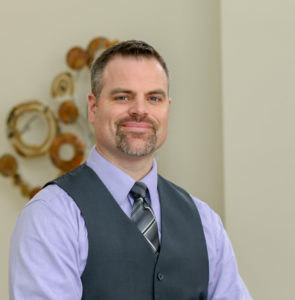 and two Board-Certified Psychiatrists: Dr. Walt Duffy, Owner, President, Chief Medical Officer – Board Certified in child, adolescent, and adult psychiatry and Dr. Bryan Beals – Board Certified in adult psychiatry. We have primary care physicians who can refer you for either or both, and they all work closely together to figure out the best course of treatment for you. There aren’t lost files, lots of trips around the city or state looking for the referral clinic, or confusion about what you need to do. You aren’t left in the dark or waiting on a callback from a provider. We make it all work in-house. With a pharmacy here, you don’t even need to leave to get the medications you’re prescribed. So now that you can see the differences between psychologist and psychiatrist, you know they aren’t interchangeable, though they often do work closely together. For optimal mental health treatment, the best course of action is usually multiple points of view and different approaches working for the betterment of the individual. The brain is complicated, but integrated—and so should be the field that seeks to treat it. Next Level You is always possible with just the right combination. March is National Brain Injury Awareness Month. Our goal for this month is to improve awareness of brain injuries, their signs and symptoms, and to decrease stigma around them while educating the public. National Brain Injury Awareness Month has been observed since 1993[i], and we couldn’t be happier to help observe it and do our part to bring awareness to a cause we have championed for 20 years ourselves. In cases of possible TBI without overt symptoms, it’s important to get medically checked out and verified. Sometimes injuries are present without identifiers. Although concussions range in severity, they should always be medically dealt with as soon as possible. Many often do not seek help, believing they are fine, or downplaying any injury they might have. At Alivation, we offer numerous ways of looking at the brain and ascertaining its health, ranging from our Brain Health Optimization Program to primary care checkups and examinations to neurology. Our providers may ask you questions about the accident or trauma and your symptoms, or about your medical history and condition in the case of non-traumatic injury. Electroencephalograms (EEGs) may also be employed to detect changes in brain patterns[iii]. With our team of expert, educated professionals, we have what you need to get properly checked out and taken care of. So what can we do about brain injuries? How can people get involved? The easiest way is to read about it, find the facts, and discuss it openly. Communicate with those who have suffered injuries and learn about the effects. Attend events. Donate and fundraise. Volunteer[iv]. 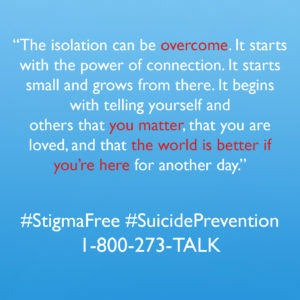 Help decrease the stigma surrounding it by educating those who don’t understand or know nothing about it. Engage with those who are curious. Visit the Brain Injury Association of America’s webpage to learn, discuss, and find events to participate in: https://www.biausa.org/. Spread the current social media hashtags, such as #BrainInjuryAwarenessMonth and #ChangeYourMind[v]. Imagine there was a non-medicinal way to treat mental illness. A lofty goal, but also not outside the realm of possibility. Doctors and scientists have known for quite some time that the positive effects exercise has on the brain can alleviate depression, anxiety, and several other disorders. Regular exercise lifts mood, boosts energy, lowers stress and contributes to a healthy cardiovascular system[i]. It makes you feel better about how you look, and overall balances a healthy self-image with a realistic cognitive one. Pretty great, right? There’s only one problem: You must exercise for it to work. That may seem like a small drawback, but for a large percentage of Americans, exercise isn’t even something on their radar. The CDC says 80 percent of Americans don’t get the recommended amount of exercise[ii]. Is the recommendation ridiculous? Does it involve hours and hours on treadmills or pounding weights? Not really. The official government recommendation is 2.5 hours of moderate-intensity anaerobic exercise a week for adults[iii]. If that seems like too much, you can do an hour and fifteen minutes of higher-intensity activity, or lifting heavy weights. You can also intermix the two. The CDC also recommends doing bodyweight exercises like pushups or squats at least twice per week[iv]. Aside from the beneficial heart impacts of these movements, bodyweight work that challenges you is also useful for maintaining crucial strength and pliability in the shoulders and knees, joints known for wearing out over the years. Physical exercise shouldn’t be misconstrued as an immediate fountain of youth. There are many people unable to complete even these simplest of movements due to injuries of the knee, or back, shoulder, etc. Some might have a heart condition or asthma that precludes the kind of strenuous body work the CDC might recommend. In those cases, exercise is probably not worth the potential drawbacks. But for everyone else, it has continued benefits. The hippocampus responds strongest to exercise. Numerous studies have revealed that as you become more fit, the size of this brain region increases[v]. As this area is the core of the brain’s learning and memory systems, cognition is improved. Simply put, cardiovascular exercise can boost your ability to remember and learn new things[vi]. Some have said it makes you “smarter”, but we won’t go quite that far. We’ll simply say that it helps you achieve the Next Level brain function that we strive for, and facilitates your body’s abilities to its best potential. You could say we’re sold on it already. But, just like a late-night informercial, there’s more! 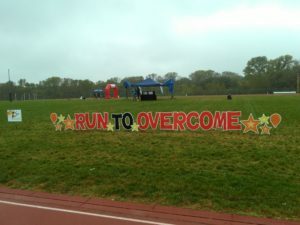 According to the Mayo Clinic and numerous other sources, exercise can ease the symptoms of clinical depression through the release of positive endorphins[vii]. Exercise also releases brain-derived neurotropic factor (BDNF), a chemical only available by being manufactured in the brain and is involved in the memory circuits of the brain[viii]. You can’t find this essential chemical in pill form. Exercise can also help you gain confidence, get more beneficial social interactions, and learn to cope better with anxiety[ix]. For those with social anxieties, exercise is a low-impact, low-cost way to improve how they want. At Alivation, we recommend the CDC’s levels of physical exercise. The body and mind are integrated so tightly that working out one seems to work out the other. The best way to keep your mind strong is to work out your body. It doesn’t take fancy gym memberships or personal trainers or a strict starvation diet to achieve the kind of effects listed here. But it does take commitment. The cliché is to say nothing worth having comes easily. It’s repeated here to reinforce the idea that we often know what it takes to improve ourselves, but we’re reluctant to do it because it isn’t as easy as we should like. The ubiquity of the internet has made it possible to research exercising and positive body movements entirely for free[x], and though we recommend exercise and physical activity for everyone who is able, we also recommend caution. Start slow, work up to your full potential. If you’re a beginner, don’t expect to excel overnight. But don’t quit just because you haven’t become ready for the cover of Men’s Health or Sports Illustrated just yet. Keep working at it. It takes time. We know you can get there if you want to. When visiting Alivation Health, the first thing that strikes you is our emphasis on brain and behavioral health services. Much of this is by our own design: We’re the brain health experts, we offer TMS, EEGs, and a host of therapy and counseling services for the life of the mind. We talk about our three branded affiliates, Alivation Health, Alivation Research, and Alivation Pharmacy. Two of those are self-explanatory; we know what research and pharmacy do intuitively. 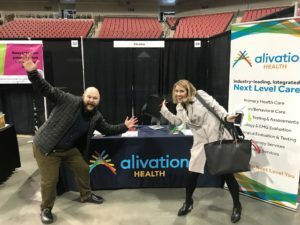 So what about Alivation Health’s Primary Care? Our primary care is as important as the other two branded affiliates for complete integrative care. We’ve said it before, and we’ll say it again and again: the body is all integrated, and so should be the body’s care. Formerly Family Practice Specialists, LLC, the clinic, which had been operating for many years, became part of Alivation’s family in 2017. Primary care is where you go when you have a cold; when you need a school physical, or a basic checkup. When you need a vaccination, or when you have a medical condition you want examined, primary care is there for you. They also do minor procedures such as mole or lesion removal, trigger point injections and ear irrigation, sutures for cuts, in-house labs for strep and influenza, audiograms, urinalysis, oximetry and vision tests, and offer a suite of medicated injections like Vitamin B12, Toradol and Depo Medrol. Their biggest virtue is that they do it all, for any need. 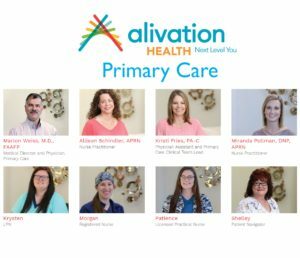 Alivation’s primary care is made up of Dr. Marlon Weiss, MD; Allison Schindler and Miranda Pollman, our Nurse Practitioners; Kristi Fries, PA-C, who has been a Physician Assistant for nine years; Krysten and Patience, LPNs, Morgan, a Registered Nurse, and Shelley, our Patient Navigator. Each one forms a crucial part of primary care, and they work terrifically as a team to see as many people as possible each day. Coming from a prior clinic background, their experience is second to none and they’re adept at the essential bedside manner. They average a few hundred patients a week, but they’re always taking new ones. What sets primary care apart from other care facilities in the region is the access to ancillary services, especially for the sick. It makes sense: when you come in for the flu, do you really feel like driving, possibly across town, to a pharmacy for your medications? Or would it be easier to simply walk upstairs, grab your medicines and go right home to bed? With our integrated setup, this is exactly what we have. Diagnosis is quick and painless; getting your prescription is even quicker, and you’ll be out the door to recover before you know it. Have a mental challenge you’d like someone to look at? No problem. The team in primary care can point you in the right direction to the proper provider or service upstairs that you’ll benefit most from. As Alivation’s primary care is less than two years old, the potential for growth is enormous. They love staying busy. With each patient taking 20-minute appointments, the days are full, but not so full that we won’t see you for whatever challenges you have. We’ll select more staff to meet that need rather than turn away patients. Our goal is to care for everyone who walks through the door, no matter if they need brain and behavioral health services, TMS, sutures, cold and flu medicine, therapy and counseling, or they want to participate in one of Alivation Research’s many beneficial ongoing studies. You name it, we have it. The team at primary care is ready to see you. Every now and then, if only briefly, it’s nice to imagine the future. We don’t all have the same vision for the future, of course, but in general we tend to view it this way: better, sleeker, more fulfilled. There’s plenty of dystopian visions out there, tempered by the utopian ones where everything works, everyone is happy, and no one wants for anything, least of all mental health care. But what if we were to imagine a realistic future, one not just guided by fantasy but grounded in reality? Something tangible to strive for, the kind of place Dr. Duffy envisioned when he started Alivation. What might we see? 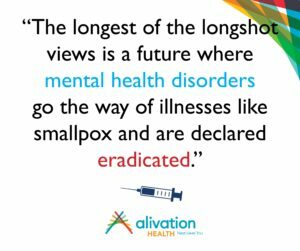 The longest of the longshot views is a future where mental health disorders go the way of illnesses like smallpox and are declared eradicated[i]. This is thorny: There is no (known) vaccine for the myriad mental health ailments that currently exist, biologically tracking mental illness to a single case would be nearly impossible logistically and practically, and often mental health disorders mutate in their own ways. For example, most mental health challenges are now viewed as at least partially responsive to the environment[ii]. Where you live, what you eat, who you know, what you do for a living and even your daily routine, including sleep, all play a role in your mental state. Bad mood may be infectious, but it doesn’t go away entirely with a pill. The solution to the longshot view, then, is a world of perfection. Everyone is satisfied, lives with the resources they need to always be comfortable, has equal access to law, medicine and income, and has an environmentally-stable living. It’s a nice thought, and one we all like to envision for ourselves and for others, but its chances of coming into being are beyond remote. Few dreamers, even in their loftiest expectations, would say it’s coming in the future, near or otherwise. But it doesn’t hurt to dream. At Alivation, we dream big, imagining a world where mental illnesses are as immediate and identifiable as physical ones, and potentially as treatable. The most realistic future is one where public policy advocates strongly for those suffering from daily mental health challenges. It would be a place where we all recognize depression, anxiety, bipolar disorder, schizotypal spectrum disorders and all others as manageable conditions that we are honest and communicative about. Numerous public figures, ranging from celebrities like Michael Phelps and Lady Gaga to Prince William, have advocated for a greater focus on mental health as a public policy necessity[iii], something to be combated and treated as best we can. Many also advocate increased funding for facilities that treat it[iv]. There will be challenges. It’s hard—closer to impossible—to change the direction of physical health with the sweep of a pen. President Nixon declared a “war on cancer” in 1971[v], and we’re sad to note cancer is still very much alive and well almost fifty years later. We’ve won many battles, but we’re not exactly winning the war[vi]. A president in the future declaring a “war on mental health” might have the same outcome. Others have proposed something more abstract, a war on the stigma surrounding mental health[vii]. This seems possible. Attitudes can change, especially in response to education. Perhaps the policy in the future won’t be a war of attrition, but a literal war of hearts and minds, the enemy not mental health itself, but our responses to it. There is no perfect society, but we at Alivation like to imagine it. It’s nice to fantasize about the frontiers of the future of mental health, where public policy declares war on damaging stigma, everyone is more communicative about their challenges, our treatments are better, our lives more enriched and environmentally stable. Commenting on and contrasting our world with Thomas More’s classic Utopia, Terry Eagleton concluded that our system is run by “dreamers who call themselves realists”[viii]. There may be no conflict in that, provided we also temper our realism with dreams from time to time. Help can come from any number of places, some predictable, others less so. Danielle (Dani) Kollasch, PA-C, one of Alivation’s very talented Physician Assistants, has a unique background that adds to her abilities to help patients. She started her medical career in the pharmaceutical industry, behind the scenes, providing help the way she knew how. Married with two kids, she thought she had a solid, if slightly unfulfilling, career track. And then she had an idea. Not content to be distant with those who needed help, Dani decided to become a Physician Assistant. 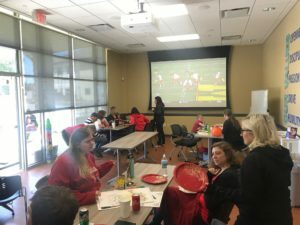 The reason stems from her desire to see more people, help as many as possible, and have a hands-on approach that she couldn’t utilize in the pharmacy industry. Her joy is talking to patients, helping them through their challenges, and taking the time to listen when many other people would not. She’s new to Alivation, less than a year here at the time of this writing. But she’s already distinguishing herself by the quality of her training and care. In any industry with customers, and especially one with patients, an open attitude and a desire to help are crucial. These qualities enable one to go far in their chosen field, and not be stopped by the obstacles that may arise. All three qualities are vitally important, but building a relationship stands out. Patients who come back to Alivation week after week, month after month, and sometimes year after year, want to trust and engage with their provider. They need assurances they’re having the best possible treatment experience they can. 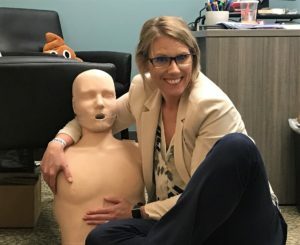 Where many large facilities will let patients slip through the cracks, or shuttle them in and out as quickly as possible to meet a deadline, Dani believes in taking the time to talk it through and find what the challenge is, and to think of solutions for how it can be overcome. Outcomes of wellness depend heavily on a foundation of trust, especially for things that can be so deeply personal. But Dani isn’t just about playing the game. She’s also about redefining the rules. In her training, she was bothered by the lack of attention given to psychology. 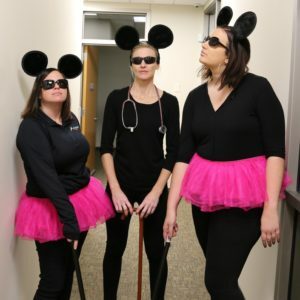 A vanishingly small percentage of people, many medical personnel, seemed particularly interested in studying or treating mental health, let alone in dealing with it as a genuine cause of ailments. It was something you learned offhand, briefly, and with minor focus. Dani wants to change that; her goal is to increase awareness and interest in understanding psychological challenges, and in seeing mental health treatment as a whole. It deserves to be taken seriously. This is also Alivation’s mission. We’re always on a hunt to discover the roots of challenges and what we can do for everyone suffering from mental health disorders. We have a research affiliate dedicated to this entire concept, and everyone here, starting at the top, believes in doing the most good for the most people. Dani sees, on average, around twelve to thirteen patients a day. She has many regulars, and greatly values the time and experiences she has with them. Many of her patients do not speak English, but the language barrier is overcome by bringing in a translator. Many are nervous or shy about seeking the treatment they need, but she tells them there is nothing wrong with wanting personal betterment and fulfillment, and that the hardest part of their journey will be the first necessary steps they must take. Dani succeeds here because she cares. And she always finds ways to help. Few diseases inspire the kind of mystery and fear that Alzheimer’s does. Alzheimer’s is ranked as the sixth leading cause of death in the United States, although new estimates suggest the disease may rank just behind heart disease and cancer as a cause of death for older people, according to the Alzheimer’s Association[i]. Alzheimer’s isn’t a normal part of the aging process. It’s the most common cause of dementia among older adults, and approximately 200,00 Americans under the age of 65 have early-onset forms of the disease[ii]. Alzheimer’s worsens over time, progressively worsening over the years. Eventually, individuals forget family members, lose the inability to carry on conversations, and respond to their environment at all. This is what inspires the most dread. Few things make up the individual like our memories. Our social connections, our familial relationships, and our memories of places and interactions form the core of our experiences. As we age, we naturally behind to forget some of those things. With Alzheimer’s, those experiences aren’t simply discarded or forgotten—they’re stolen. A grandparent, a parent, a friend losing their memory of you, who they are, and where they are is particularly tragic to us in this light. We lose our core selves. Alzheimer’s is named after Dr. Alois Alzheimer, who, in 1906, noticed changes in the brain tissue of a woman who had died of an unknown illness—an illness that “included memory loss, language problems, and unusual behavior”[iii]. Upon studying her brain postmortem, Dr. Alzheimer found abnormal clumps (amyloid plaques), and tangled bundles of fibers, called tau tangles. These are still considered among the main features of Alzheimer’s, along with the loss of connections between neurons in the brain[iv]. Every year, scientists get closer to understanding the illness a little bit better. Damage to the brain is now thought to occur “a decade or more” before cognitive problems begin to appear. Abnormal deposits of proteins form the amyloid plaques and tau tangles throughout the brain, and neurons lose connections with other neurons, and die[v]. This is what causes the progressive memory loss, dementia, and eventually death. 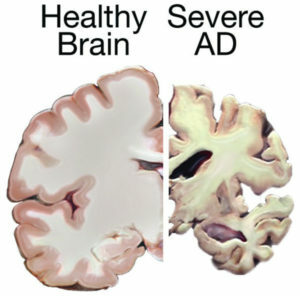 Genetically, a gene called APOE is involved in late-onset Alzheimer’s. Carrying a form of this gene does not definitively prove a person will develop Alzheimer’s, and some people even lacking the gene entirely may still develop the disease[vi]. Advances in brain imagining are moving us closer to seeing and understanding the illness better than ever, helping track the very earliest steps in the disease process. As for lifestyle factors, there is a great deal of interest in the link between vascular conditions such as heart disease, stroke, and high blood pressure, many of which bear resemblances to Alzheimer’s. Researchers are currently studying how reducing these risk factors may reduce the risk of Alzheimer’s. In the meantime, a nutritious diet, physical activity, social engagement, and mentally stimulating pastimes are all associated with better health and physical, and mental, longevity, according to NIA[vii]. Asking the person and a family member or friend questions about overall health, past medical problems, ability to carry out daily activities, and changes in behavior and personality. Conducting tests for memory, problem solving, attention, counting, and language. Carrying out standard medical tests, such as blood and urine tests, to identify other possible causes. Performing brain scans, such as computed tomography (CT), magnetic resonance imaging (MRI), or positron emission tomography (PET), to rule out other possible causes for symptoms[viii]. If you suspect you or a loved one might have Alzheimer’s, any form from early to late-onset, come in to Alivation as soon as you can. Early detection is essential. With a range of doctors, PAs, neurologists and psychologists on staff, we’re able to provide clarity for your ailment, and how best to treat it. We’ll always be with you in your journey to the Next Level. There are many illnesses in the world with visible symptoms. You get chickenpox, and everyone can see it plainly. The common cold or the flu is visible, too: coughing, sneezing, runny noses, the works that we’ve all had. But what about disorders that aren’t visible? If there are no outward symptoms, how can we know something is wrong? This is the common challenge of major depressive disorder (MDD). If you have MDD, you know it. You can’t shake a feeling; you can’t rise out of your feelings of inadequacy, or worthlessness, or sense that nothing is worth it. Your motivation has plummeted. You feel alone, often anxious. You have no energy but can become irritable quickly. Sometimes you can’t even leave the house, and maintaining relationships even with close family members feels like an insurmountable task. It’s like living with cement blocks on your feet, and you’re dragged down every time you try and move away from it. These are the symptoms depression sufferers know all too well. It isn’t a mystery what’s going on, and your symptoms are as prevalent as any cold to you. It can be completely debilitating. Given the link between suicide and MDD, it can also be fatal[i]. So what’s going on? Depression isn’t like the flu or chickenpox. It isn’t caused by a virus, and it isn’t found in unclean drinking water. It begins where it lurks: in the brain. The exact causes of depression are not clearly understood. There may well be a variance in the causes from person to person. The current best theory involves monoamine neurotransmitter activity, specifically levels of serotonin. Neuroimaging can show us depression activity in the brain. It isn’t just “in your head”—it’s real, scientifically verified[ii]. There’s nothing worse than being told nothing is wrong with you when, clearly, something is off. For years, depression, and postpartum depression in new mothers, was brushed off, handwaved as something that was in the sufferer’s head in the worst way, i.e. fictional[iii]. “You’re fine!” “Just feel better!” Even today, sufferers of MDD still encounter these responses to their challenges. Those without depression, though often well-meaning, can’t understand what it’s like. It simply isn’t part of their daily life. In the past, it was hard to understand how mood was not in the patient’s control. We’re used to the idea that we can improve ourselves, and that good things make us feel good, and bad things bad. So why didn’t good things help? Why did sufferers feel bad with no outward cause? In many cases, their lives were average, with no remarkable amount of trauma or hardship. How could they feel this way? Were they faking it? Was it for attention, or did they lack the will to improve themselves? We know a lot more now. The medical community began to listen more, and the emergence of new technologies, such as neuroimaging, along with wide swaths of case studies convinced them that what they were seeing was genuine. Depression isn’t like the flu; you won’t catch it on the subway. It doesn’t obey communicable disease rules. It’s likely genetic, and often found in families. It ranges in severity from mild to debilitating, and the symptoms sometimes lack consistency: many depression sufferers will overeat, while others will not eat enough; many have disrupted sleeping patterns, with some sleeping too much, and others not enough. Episodes can “range in duration from hours to years”[iv]. One famous sufferer of depression was Abraham Lincoln. In his day, the disorder was called “melancholy”, and he was characterized by “fits of gloom” and an unknown sickness[v]. Treating depression isn’t a one-size-fits-all approach. Some people naturally recover on their own. Physical exercise has been known to benefit depression sufferers[vi]. The most common treatments for depression are a class of medication called Selective Serotonin Reuptake Inhibitors (SSRI). There are many common, effective brand names for them[vii]. Therapy and counseling are also effective for many. For those who’ve tried medications and therapy but have a stronger case of depression, Transcranial Magnetic Stimulation (TMS) is offered at Alivation. It uses targeted magnetic waves on the areas of the brain causing depression. It is enormously effective, and its use is only continuing to expand throughout the country[viii]. One new proposed treatment for postpartum depression is called Sage 217, which works on the brain’s gaba system, something no other current treatment does[ix]. More research is needed on this interesting medication. We’re here to help in any way we can. We offer a variety of treatments, including medications, therapy services, and TMS. For those looking at other options, Alivation Research has conducted countless, in-depth studies on depression and its effects, and likely will have more studies in the future you could participate in. If you have depression, know that you’re not imagining it, and it is a real disorder. But take heart: because it’s real, we’re able to locate and treat it. The question has been asked: diet and nutrition impact our physical well-being, so do they affect our mental well-being, too? 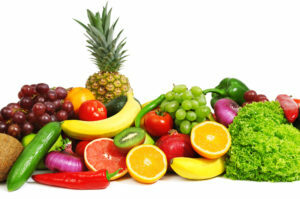 It’s called nutritional psychiatry, and it’s growing every day[i]. The concept is simple: much like a car requires a certain type of fuel to run its best, so does a brain, also an engine, require the right fuel to run its best. We’ve known the body and the mind are integrated for many years, and what one does impacts the other. To lose weight or prevent heart disease, you eat healthy and exercise. That’s also why we set up Alivation the way we did: pharmacy works with primary care, which works with research; when everything runs together, it runs smoother. It makes sense that the same is true of the brain. What kind of diet exactly are we talking about? It depends on the research you look at, but a diet that comes up often in the literature is the Mediterranean diet. With its emphasis on vegetables, especially leafy greens, and fruits, fish, legumes, nuts and other heart-healthy fats, the diet is tailor-made for physical well-being. Some studies have shown issues with weight and obesity can lead to negative mental well-being[ii]. A healthy diet that sheds excess pounds, the NCBI says, may contribute to a better sense of self, and a healthier outlook on life. Some studies show a direct link between the Mediterranean diet and a decrease in depression[iii], and plant-rich diets to alleviate symptoms of major depressive disorder (MDD)[iv]. We’re still waiting on longer-term studies to show the benefits of dietary intervention in depression, but early results seem to support the idea that it can indeed have a positive impact from even small changes[v]. From another angle, it’s been theorized that nutritional deficiencies can contribute to negative mental well-being. Shortages in things like omega-3s, zinc, iron, vitamin D and folate have been linked to depression and anxiety[vi]. Many sufferers seem to have diets that lack adequate amounts of these things, as well as essential amino acids[vii]. Gut health, especially the probiotic environment, which aids in nutrient absorption, has been linked to the crucial neurotransmitter serotonin (Harvard Health)[viii]. Exercise has long been well known as a natural way to fight depression and anxiety as well. According to Psychology Today, strenuous activity releases endorphins, which increase positive activity and feel-good hormones in the brain[ix]. With a diet and exercise regime that results in weight loss, the mental health benefits are boosted by the positive changes to body image. Help Guide says some people may also benefit from calming exercises, such as yoga, that practice the mind-body balance and decrease anxiety by focusing on something else[x]. A plant-rich diet, low in processed foods, sugar and red meat, and higher in fish, nuts and fruits, seems to be beneficial for not only physical well-being but also mental health. The lifestyle changes work best after two to three weeks, when the body naturally begins to reprogram from a “pro-inflammatory” diet[xi]. Coupled with physical exercise or increased daily movements, and the changes are magnified. For those who made a New Year’s resolution of losing weight or living healthier, the science backs up the mental health benefits of doing so, giving you another reason to follow through. Now is the time to make the positive changes that will make 2019 a physically, and mentally, healthful year. We don’t do lobotomies at Alivation. This doesn’t surprise you, right? It shouldn’t. But in the dramatic world of popular culture and entertainment, a lobotomy is the sort of thing commonly practiced in mental health facilities. Just look at One Flew Over the Cuckoo’s Nest. Happens all the time, right? The simple truth is, so much of our worldview is influenced by what we see on TV, in movies, in the books we read, or the music we listen to. Astute cultural observers have tried to pin down exactly where truth ends and culture begins, or vice versa. Do we make art, or does art just express what already exists? We’re challenged every day here by people’s perceptions and what they expect. We do our best to educate, but sometimes those preconceptions are just too strong, and patients don’t seek help because of what they expect, or seek help based on dramatic but false notions of mental health treatments. Let’s start with some common ones. Raise your hand if you’ve seen any of the following TV shows: The Sopranos, Frasier, Monk, 13 Reasons Why, In Treatment, Mr. Robot, and Unbreakable Kimmy Schmidt. Now what about any of the following films: Good Will Hunting, The Prince of Tides, Analyze This, The Perks of Being a Wallflower, A Beautiful Mind, One Flew Over the Cuckoo’s Nest, Girl, Interrupted, Awakenings, Side Effects, What About Bob, The Departed, As Good As It Gets, Ordinary People, or It’s Kind of a Funny Story. I bet you can name even more than this off the top of your head right now. There is no shortage of therapy and mental health themes in movies. 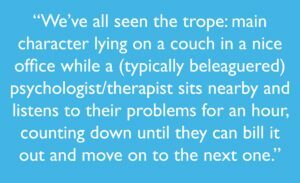 We’ve all seen the trope: main character lying on a couch in a nice office while a (typically beleaguered) psychologist/therapist sits nearby and listens to their problems for an hour, counting down until they can bill it out and move on to the next one. There are usually ample amounts of Freud-by-way-of-Hollywood psychobabble and screenwriter lingo to fill the moments in between the character affectations. Where does this come from? The answer is more art than science. In screenwriting, the main goal is to get as much exposition out of the way as simply as possible about our characters. This paves the way for audience identification and the initiation of the plot. In a three-act structure, the first act is exposition/setup, the second act is the longest, with the protagonist beginning their journey and facing obstacles, and the third act is the resolution and climax. You also want to show growth for the character over their journey. This is why many films and TV shows begin with the character in therapy and end with them in therapy, but having learned something about their expressed problem along the way. One character wants something, and there are obstacles to them getting it. That’s how and why we have stories. Understanding that, we forgive the movies and TV shows for portraying psychology in a not-so-realistic way. It’s a shorthand for the real thing. Actual therapy is more sessions, and active involvement from the patient. It’s more work from everyone involved, but the benefits are also larger than one character having a “revelation moment” at some point in the 90-minute movie. At Alivation, our therapists are much more involved and, we like to think, helpful than the ones in the movies. They certainly enjoy their jobs more, and they care about the people they see. Depression and suicide are other common themes, especially in films like Prozac Nation and Girl, Interrupted, and for the same basic dramatic reason: it illuminates a character. We identify with those who are troubled, or challenged, or, sometimes, unbalanced. We like interesting people, and screenwriters know that. We don’t expect the portrayals of the field to end any time soon, and we’re always here to clear up misconceptions. We at Alivation love those same movies and shows, too. We only get concerned when fabricated cultural views get in the way of real help for people who need it. This is our way of asking that you, please, not get your psychological advice from a movie. If you’re having challenges, please call us and set up an appointment today. We’ll show you the reality of treatment and how help is, in fact, reachable. Looking back at our great year. We’re sure 2019 will manage to be even bigger! We like to think we can always do better. Perhaps that’s a radical statement, but we believe it. For us, Next Level also applies to ourselves as an organization. Of course, Alivation doesn’t make the sort of resolutions the average person does. According to polls, the most common New Year’s resolutions are exercising more, eating healthier, and saving more money. We’re not able to exercise more, or eat healthier, of course, but saving money? Sure, that’s something an organization could strive for. But it isn’t the kind of resolution we mean. Don’t get us wrong: all those resolutions are very beneficial to an individual. Our resolutions are a little broader, but no less important to our health and well-being. They aren’t as easy to define, but that doesn’t mean they are indefinable. Rather, our resolutions are centered on the way we grow, how we treat others, our place in our community, our engagement levels with patients, and the ways we’ll reach more people in the coming year. It’s no secret that we’ve grown a lot in 2018. We’ve added a lot of staff, and it seems likely we’ll add more in 2019. We resolve to grow more because our increased staff numbers allow us to see more patients, and to potentially help even more people. We don’t need a New Year’s resolution to see more patients, but we like to take the opportunity to reinforce our commitment to the betterment of the larger community. We never stop sharing our message, no matter the time of year. We’ll keep striving to best educate our patients on their options, and the possibilities we have for the betterment of their care. Part of how we’ll do that is expanding our marketing and our reach. We want to make sure everyone who needs help is aware of us, and of how approachable we are for whatever challenges they face. Pursuing that goal, we’ll revamp our website, add more content, and reach out more through different mediums both electronic and print. As many people can hear about us, and more importantly, of the help that is available to them, the better. We want to be the brain health experts. We have the tools, the talent, the staff and the setup to make it happen. It may be a longer term goal, but there’s no harm in pledging ourselves to better things at this time of year. Next Level is every day, all the time. For our last resolution, we’ll need some help. We’ll need help from patients in letting us know how we can do better for them. We welcome the feedback. We love to hear ideas from our team members for how we can better serve our population as well, and for how we can see more and find novel ways to increase our already-great quality of care. We still believe in improvement no matter how great we are. There’s always room for it, and the sky’s the limit. We resolve to always consider the best new technology to better treat our patients, and to consider the best financial options for those who need assistance but have trouble with the cost. We always need people to be open and honest, and our final resolution is to take sincere and useful suggestions to heart, the better to improve and evolve in the best ways possible. We are beyond excited for the opportunities 2019 holds. On Friday, December 14th, we hosted our annual holiday party in the Haymarket. (If you haven’t yet seen the pictures, you can see them here). 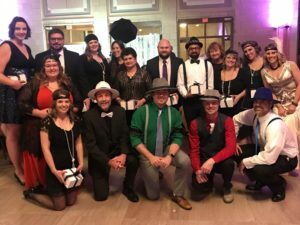 We have a tradition of awards and recognition for those team members who have really stood out the past year, not only to the executive team, but to their peers and coworkers. When we have a consensus, it makes the process even more valuable. 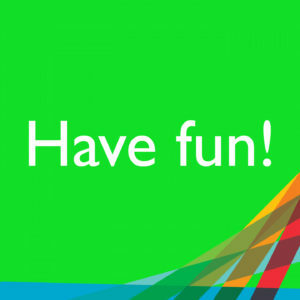 It isn’t just about performance, either—we like to have fun here. 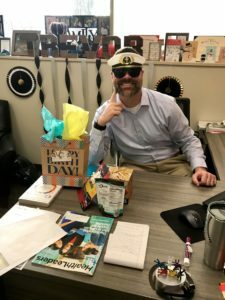 Dapper Dude and Fashionista are among our more light-hearted categories that also recognize those who bring great personalities and Next Level fashion to the office. Honest Abe, the person who is honest no matter what, good or bad: Kayla A. 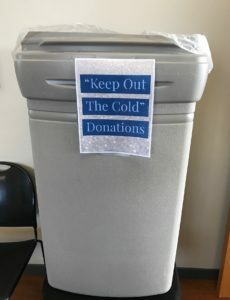 In addition to the awards presented, Alivation made a sizable contribution to Jordan Knapp’s Keep Out the Cold charity as part of the company’s annual program of donations to worthy, proven causes with outstanding benefits to the community. We hope to keep helping people in numerous ways for years to come through this system, and Jordan’s cause is one we were happy to get behind. 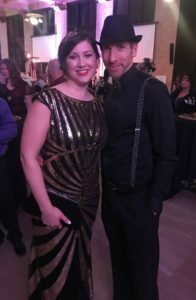 But our holiday party isn’t only an awards ceremony, or a good excuse to dress up and dance. It’s also an opportunity for our many new team members to meet and mingle with their new coworkers, and get to know one another in a less formal setting than the office. We have a lot of staff now—we’ve grown quite fast lately—and with the size of our building and busyness of different departments, we don’t often have a chance to all be in the same room together. It’s almost like a company reunion. Like everything we do, even our celebrations are Next Level. With our outstanding growth, maybe next year’s party will have even more great nominees and more categories to fill. Alivation is proud of its diversity. We have many modes of thinking, many modes of beliefs, many avenues of Next Level Care for our patients. We’re not a uniform bunch, and that’s what sets us apart from more conventional organizations. And this same diversity applies to our year-end celebratory efforts and how we choose to give back. The end of the year is when we, culturally speaking, start thinking about others, our contributions to others, and what we can do to brighten the days of others. Next Level doesn’t just apply to our care, but in how we treat and reach out. Each year, team members of Alivation donate gifts to the kids at CEDARS. It’s a wonderful cause. Our hope is to do all we can to brighten their days and give them something special. This year, we had too many presents the first time around for one trip. We’re making another one later this week. This is the sort of thing we’re overjoyed about. Our culture encourages helping others in any manner they might need it. Our team members are generous in spirit. 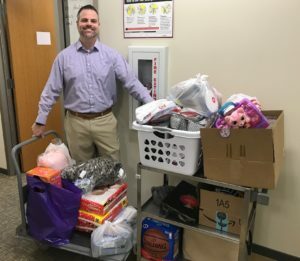 Jordan Knapp, one of our Collaborative Care Coordinators, heads the “Keep the Cold Out” charity, where he collects winter clothing for the homeless. He was once homeless himself—he knows firsthand that in the cold Nebraskan winters the gift of a coat can make the difference in someone surviving. Our holiday party is being held on Friday, December 14th. The theme is Roaring Twenties, and we’ll be dressed to the nines for a fun evening. On top of just having a good time with our fellow team members, we also hand out awards to those who have gone above and beyond in several categories. We’ve always believed in giving shout-outs and recognition to those who truly exemplify the Next Level spirit throughout the year. It’s always hard to choose—so many people make good candidates for these awards. We’re blessed with an abundance of talent, drive and passion. It’s always been important to us to be more than just a healthcare facility, or another organization. Our ambitions are lofty, but justified: we want to be an integral part of the community, and an integral part of countless patients’ personal journeys to their own Next Level. We don’t set small goals for ourselves because we don’t want to achieve small things. We want to help as many people as possible, and in as many ways as they can be reached. We encourage everyone to give a moment or two to think of the needs of others, and the meanings and feelings of this season. With a new year rapidly approaching, this is when we make our goals and our resolutions. Please, if you’re able, donate to the kids at CEDARS. Donate a coat to Jordan’s charity. There are many, many other fine charities ongoing throughout Lincoln this time as well, which are listed at the link below. Donate to whichever you like, or all. Give what you can to help others get to their Next Level. We have a vibrant team culture, and working together is monumentally important to us. We love taking the time to recognize the heart and spirit that makes better things possible. In the old days of medicine, if you had a diagnosed condition and were prescribed a medication to treat it, you took the medication and hoped for the best outcome. Possible side effects, based on extensive lab testing and FDA notices, were discussed before you took it. They ranged the gamut from medication to medication—some side effects were mild, dry mouth, headache, upset stomach, etc. Compared to the benefits reaped from the prescription, these were all minor deficiencies. But sometimes there were others. Certain medications could work well in one patient, but then cause unwanted adverse reactions in another. Liver or kidney failure, uncontrollable bleeding, stroke, and even death occurred in the worst cases. Clearly, the benefits did not outweigh the risks of these medications. It’s thought that about half of filled prescriptions are not taken as directed, and a big reason for this is the associated side effects[i]. Wouldn’t it be nice, people said, if they could know the likelihood that they would experience adverse effects before they started treatment with a new prescription. Allopurinol: certain ethnic groups (e.g., those of Han Chinese or Thai extraction) are more likely to carry a gene that increases the risk of a severe allergic reaction to allopurinol, a medication primarily used to treat gout[ii]. At Alivation, pharmacogenetic testing is conducted via a cheek swab. It’s one of the least invasive methods of collecting genetic data. A patient simply sits and thoroughly rubs the inside of their cheek with a cotton swab. You can’t overdo it, but you can underdo it, so it’s encouraged that you swab for around thirty seconds. This swab is then sent to the lab, and around two weeks later the results come back. When your genetic information is taken from the cheek swab, the lab then possesses that information. Since you own your genetics, however, what they do with it after the test is up to you. With your consent, they will conduct genetic research and testing using the sample. Totally anonymous, and you won’t ever hear about it. But if you request the information destroyed, they will discard the sample and retain nothing from the test once it is conducted and finished. You always own your genetics. When you undergo the cheek swab, you’re allowing us to merely rent your information for the time it takes to ensure the best possible treatment for your condition. There will always be challenges to medical side effects and genetic testing. Although pharmacogenetic testing is very useful, it isn’t perfect, and there are still many conditions we can’t predict yet. Moreover, every patient is different, and it is important to note that the test is just another piece of valuable information to help providers determine the best treatment option. But the science gets better every day. We offer genetic testing because it’s part of our Next Level creed. We want people to have the best possible treatments with all medications, and the potential reduction in side effects before they happen is certainly worth it. Next Level Care starts with making and confirming appointments for the services you need. At Alivation, we have a series of coordinators who, as part of their jobs, make sure patients are scheduled to receive the services they need and with the team member who is best equipped to do it. When you come in for a care, there’s a good chance you’ll get to meet Jordan Knapp. Jordan is our Collaborative Care Coordinator. He sees, on average, twenty-six people a day, and can spend anywhere from five to forty-five minutes with them, depending on what they need. The shortest appointments involve people answering basic questions and agreeing to a scheduling. The longer ones are in-depth, where patients ask questions, with Jordan walking them through their options and the science of what they’ll be experiencing. Jordan’s passion for medicine began when his mother had a stroke while he was in high school. He was on the football team, and suddenly his world, and his priorities, had shifted dramatically. This terrible catalyst made him feel powerless. The world was now life and death terms, and with his father not in the picture, it was up to him to help his family survive. He dropped out of high school to work fulltime, struggling to make it work. They were homeless for a time, living in the mission, and here he saw physician’s assistants treating and washing the feet of the homeless population to earn their trust, to better care for them. It sparked a calling in him that continues to this day. 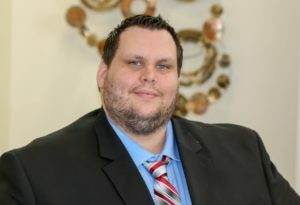 Jordan eventually went back and earned his GED, and graduated from the University of Nebraska-Lincoln with a Bachelor of Science in Business Administration and pre-medicine with an emphasis on biology and chemistry in 2016. He was the first in his family to graduate. He has a passion for neuroscience and studied under Dr. Molfese, founder of the Center for Brain, Biology and Behavior (CB3) at UNL. During his time at CB3, Jordan focused on EEGs, learning disabilities in adolescents, and concussions in athletes. He wants to go to UNMC and become a doctor. From his interactions with patients, his bedside manner and ability to be open and honest with them while explaining difficult concepts, he will make a great one when it happens. He can talk about dendrites and axons or cheek swabs one minute, and transition to simply listening to their concerns in the other. He considers himself an essential bridge between the patients and the providers who will carry out their service. Because of his time in the mission, Jordan has a passion for service and helping the community. Each year around the holidays, he organizes a clothing donation drive for those less fortunate. He never lost touch with his roots, and he never forgot that when you’re homeless the Nebraskan winters can be unforgiving, even deadly. The gift of a coat, he says, can mean the world to someone who is living on the street and lacks warmth. Jordan has helped thousands of people while here, and likely will continue to help thousands more in the future. He serves a wide, diverse population and can do so with a smile and cheerful demeanor the entire time. He’s one of the friendliest people you’ll meet. Jordan exemplifies our Next Level motto. From his challenging beginnings to his ultimate achievements, he is one of the best examples we have. It’s Thanksgiving week, and though we don’t have a costume contest at Alivation, we still celebrate the holidays just the same. We love Thanksgiving: food, family, a day off from work. It just has a little bit of everything. One of the things that goes along with the holiday is saying what you’re thankful for. We’ve been around a long time. Premier Psychiatric, our former company name, was founded in 1998. We rebranded almost two years ago to what we are now. 20 years is an excellent run for any company, and we’re thankful—beyond thankful—for the longevity. We’re thankful for the ability to keep serving patients, keep trying new technologies, keep doing better and doing all that we can. Mostly, we’re thankful for the patients. Everything we do, and all the great things we have achieved, are both for and by patients. We see hundreds of them a day. Their business keeps us in business, and we’re thankful that for all these years, and in whatever name incarnation we are in, they trust us to do a great job. They trust Dr. Duffy and have for many years. They trust our staff, our providers, our nurses, our care coordinators. We can only help if there is mutual trust. We’re thankful for that trust, as it is crucial to doing a great job. We’re thankful that the regular business of our patients has allowed us to invest in new treatment and assessment technologies, and new, dynamic employees to use those technologies. We’re thankful for the opportunity to advance the understanding of brain and behavioral health, and to help more people than we previously could. Every day we reach someone new who needs us is a great day. Every person we see is an opportunity to positively impact someone’s life, challenge ourselves, work harder, and build and grow while helping. We’re thankful that our patients and staff have helped us live up to the Next Level Care motto. We’re thankful that they trust and believe in us to partner in their care. We’re thankful people are willing to do all that is necessary to reach that Next Level, and their hope and commitment inspires us daily to do all the things we promise to do. We’re thankful they help us uphold our core values. Without those values, we wouldn’t be what we are today. We wouldn’t have the discipline, humility, drive, passion, and openness that it takes to do truly extraordinary things in this field. We’re thankful we stand out from the rest. We’re going to keep growing. We’ve added many new people to our team this year, and we’re thankful for all of them. They love working here, and we’re thankful we’ve spent the time and effort to build the kind of company people want to work at. Our company culture didn’t happen overnight, and we’re very grateful for all the staff that work to make this company inclusive, efficient, warm and essential. This time next year, I’m sure we’ll be thankful for even more great new people who’ve joined our ranks. We’re thankful to be in your lives. We’re thankful to help. We’re thankful people believe in our mission, and come back to allow us to help them with some of the most trying challenges they may face. We’re thankful that we’re not just a medical facility, but a place that can help, a place that invites everyone to work together to be the Next Level. We’ll never stop being thankful for it, even if we mainly acknowledge these things around Thanksgiving. We’ll never stop doing all the things we do, because they’re the right things to do. Thank you to everyone who has helped make it all possible. If you were to Google ketamine, any number of things would show up. If you talked to someone on the street, they would likely know it as a club drug or a tranquilizer for farm animals. It would be unusual if they knew about the ongoing research and trials of this treatment, and about how excited the medical and research communities have gotten about it in recent years. Ketamine is a fascinating, exciting topic of interest because of its possibilities for depression treatment, and this is what Alivation uses it for. Ketamine is administered via a nasal spray or an IV. At Alivation, we offer the nasal spray. For recurrent depression, this is administered once a week. Some doctors and scientists say, with evidence, that this might be the most important treatment for depression that’s come along in years. Numerous studies have shown this, and though it is not yet FDA-approved, clinical trials are ongoing and show great promise. As part of our mission of Next Level Care, Alivation has watched these trials with great enthusiasm, but perhaps more importantly, we have practice-based evidence showing tremendous results. 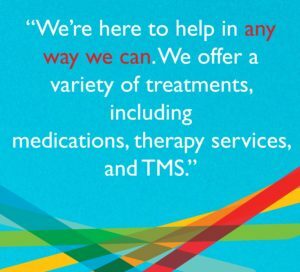 We love being on the front lines of better treatment for patients. Ketamine works far more rapidly than other antidepressant medications—one of its main virtues. Sometimes doctors prescribe ketamine along with an antidepressant. The ketamine is taken in the weeks before the prescription begins to work, providing faster relief from symptoms of depression. Those can be critical weeks for the patient. At low doses, ketamine also helps sedatives work, and is sometimes administered after surgery. One of the best uses of ketamine is decreasing suicidal ideation. Because it creates a euphoric effect at the right dose, ketamine, for individuals who are contemplating or have attempted suicide, works. The right euphoric feeling, coupled with a decrease in depression in the brain, can provide the essential window that might save someone’s life. It’s easy to see the benefits of such a thing. If a chemical imbalance is the problem, the treatment is to alter the chemistry. Alivation uses ketamine for this and other purposes because it has shown results. The biggest thing to remember about ketamine, per doctors, is to temper expectations for the treatment. Those who expect a miracle cure overnight, or who’ve only heard the outstanding benefits need to know that the trials for it are ongoing, show great promise, and with the correct understanding and expectations, this treatment can prove very effective for many people. Like many things, it may not work for everyone. But the fact it works for some is an excellent reason to keep exploring it as a treatment possibility. The research will always follow ideas that can save lives. With suicide such a global problem, and clinical depression often being debilitating for a great many people, the idea that a nasal spray could prevent or alleviate the symptoms is wonderful. The situation now is to earnestly follow the trail wherever it leads, always embracing the science and the real life results we witness in our office. If you’re interested in ketamine or want to help expand this area of research, check out our studies online for any available dealing with this. Research and use the resources at the end of this article to become informed about ketamine. Explore options. Ask friends and family about it. If you suffer from depression or suicidal tendencies, call us about options or if you just want to learn more about this exciting new treatment possibility. We’re always happy to provide information, and we’re always researching the Next Level treatments of tomorrow. If you’ve ever read about Alivation, or even heard us speak about it, you know we use the term integrated care frequently. We use it often because it’s the entire backbone of our services, outlook and organizational setup. But is it just a buzz term? Something we picked because it sounds good, corporate speak that’s purposefully vague? Integrated care is a concept used widely. The largest integrated care delivery system in the United States is the U.S. Department of Veterans Affairs[i]. According to the NCBI, the two largest private delivery systems are Kaiser Permanente and the Mayo Clinic[ii]. It’s likely you’ve heard of all three, and just as likely that you’ve even received care from one of them in the past. Alivation Health, while a bit smaller than those, follows the same framework of integration. Here’s what that means, simplified: coordination of care and services overlap. It is different than horizontal or vertical integration in that there is significant collaboration and overlap of services between our brain health and primary care specialties, Alivation Pharmacy, and Alivation Research. Each operates with their own autonomy, but they are in constant contact with one another, and function as a collective team when providing whole person, integrated care. 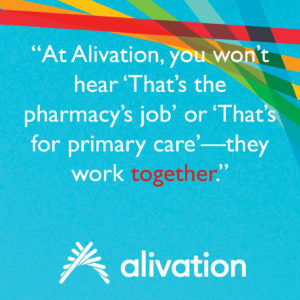 At Alivation, you won’t hear “That’s the pharmacy’s job” or “that’s for primary care”—they work together. They hand off when they need to, pick up where they can (or should). But integrated care isn’t limited to the U.S.—it is a worldwide concept. Even the World Health Organization has specific guidelines for the integration of healthcare around the world. They stress the importance of the framework, while also emphasizing the necessity of availability for the services and care listed[iii]. Simple: we feel it is the best healthcare delivery system. On top of just making sense for our organization, the integrated care framework is a proven model that has excellent successes. The quality of life and the quality of outcomes we’ve seen have only reinforced our position over the years. We can’t help but believe in it now. It’s crucial that brain and mental health be treated as importantly as physical health. The brain only functions properly if the body functions properly, and vice versa. Much like our care framework, the body is all integrated. We like to think we’ve taken the design from nature, and the human body itself. The key challenge is to make sure it all runs smoothly. Again, like the human body, the engine must be functioning correctly for everything to work as it should. Communication is a crucial component. Our entire culture is very proactive in working together, communicating challenges, and speaking freely about good ideas as they come. We like to hear from everybody who works here. There isn’t the usual hierarchy, and conventional wisdom is always game to be questioned and tested. So, though we do integrated care as well as the largest providers in the U.S., we also do it interpedently and have our own ideas. It keeps us unique and keeps us focused. It keeps our patients happy and healthy and delivers the best in the best way we know how. It’s part of the Next Level Care definition. It’s one of our favorite times of the year! We love the leaves changing colors, pumpkin spice-flavored everything, and of course, dressing up for Halloween. Really, is there anything better than that? We do it tastefully, as we’re still a functioning medical facility. But we also have fun—it goes along with our good culture. Maybe it just speaks to what great people we have here that they’re able to do both simultaneously, and still be top professionals. The costumes are never too ridiculous, but don’t tempt us…we love going all in. 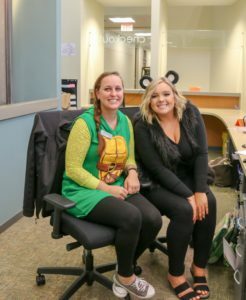 In a larger way, our Halloween spirit comes from our team culture and spirit. We wear our own costumes, design what we want independently, but also function together as a team, always while having fun and doing the best we can, no matter how we look. This is the key to our atmosphere. 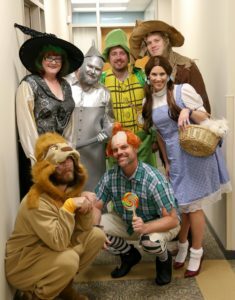 The Culture Club, which includes People Resources, is banding together to dress up as characters from The Wizard of Oz. 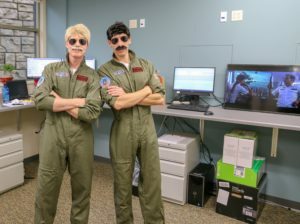 The IT department, Shawn and Nate, are rocking Top Gun costumes. The actual film is playing on a loop in their office. There’s a Waldo, cats, and the Teenage Mutant Ninja Turtles. We love the individuality and creativity that comes with Halloween. We like to think we do it the best too, but again, we’re biased. 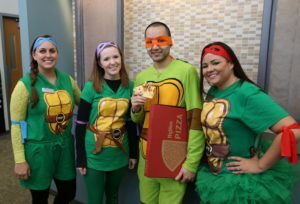 We believe in our company and its employees and their ability to rock any costume. All day today, we’ll be posting pictures on social media of the various getups we find and like, and we’ll be crowning a winner as well. So keep track of this page and our Facebook and Twitter feeds to see some of the exciting and amazing things our stellar team has come up with to celebrate this fun time of year with. It’s possible we jumped the gun there just a little bit. But the fact remains people do want to work here, and for two big reasons: 1) The ability to help people with the most advanced technology in the industry, and 2) our great culture. This isn’t just a shameless plug for the benefits of working at Alivation—it’s the truth. Allow us to prove it. At the Lincoln Business Expo this past Thursday, we talked with hundreds of people. Many of them worked at other great businesses around Lincoln, but many were just strangers off the street who had never heard of us before. The logo, with its rainbow of colors, catches the eye. When they ask what we do, we tell them. We state our mission, our history, our ideas and the services we offer. And then they want to hear more. It’s our pleasure to go into detail. We like working at a place where the atmosphere breeds creativity and originality. We aren’t owned by any larger corporations, not responsible to a conglomerate. We’re independent. We like to try new things, be pioneers; we like to meet new people, we like to make a difference. Nothing makes us more fulfilled than reading the testimonials or hearing from grateful patients about their experiences. People get enthusiastic about EEGs. They love having the invaluable power of knowing when their brain is healthy, and when it is not. For many people we talked to, dementia and the care of the elderly, such as parents or grandparents, was of paramount concern in their minds. It can be hard to know when someone is slipping, or when their cognition is not 100% anymore. We like to offer them the ability to find out for sure, and to see what we can do to slow or reverse that process. 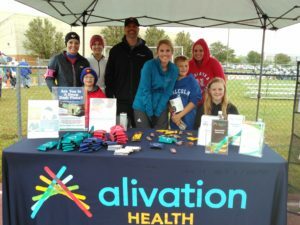 For parents with children in athletics, our brain health optimization program was of great interest. TBI is no longer a matter to be brushed aside, or dismissed by overeager coaches: it is a serious event. The data we can provide, and the science we show, demonstrates clearly how very real it is. To us, the brain isn’t something cut off and remote, unable to be studied. It acts concurrently with the rest of the body. Healthy mind, healthy body, and vice versa. That’s the definition of integrated care, and why we offer all of it here. For those with depression, or bi-polar disorder, our therapy and pharmaceutical services are top-notch. We’re also one of the nation’s top providers of TMS, and we’re proud of that—it works. Study after study now concludes what we’ve said for years, and we’re happy to be there to help all that need it. We’re always expanding. We get new patients every day, and the growth is exciting. We’re always selecting for new PA’s, and experience coordinators, and anyone else we can find to make sure we see you on the day you want to be seen. We don’t like waiting, and we know most patients don’t, either. Health should be a priority for all. Those who work best here are those who share in this vision, and this overall mission. We have the best technology to serve patients, and we love being on the cutting edge. We’re not ashamed to say it’s cool. So, Alivation is selecting. If you fit our criteria, please apply. We’re happy to share our mission with you, and we’re happy you’re interested in us. We can all make a difference together, and there is nothing more exciting than that. You can be part of something big, something helping take us to the future. 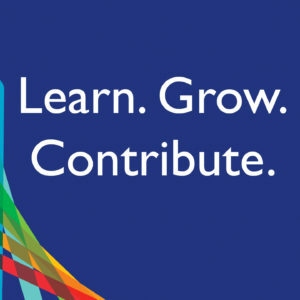 Our culture, our core values, our drive to be better—all integrated. You could say people want to work here because we’re the best. No one likes being sick. This isn’t a revolutionary fact to admit, but it’s a simple truth. And coming up on this time of year, with the first snow already recorded, influenza will be rearing its head once more. You only catch influenza by being exposed to the virus. Cold weather does not cause influenza—flu season just happens to coincide with the cold season[i]. With that season comes the vaccine. The flu shot protects against the three or four influenza viruses that research indicates will be most common during the season[ii]. There are several different types of vaccine available. The Center for Disease Control (CDC) recommends any of the various licensed, age-appropriate vaccines for the 2018-2019 season, with no preference for one over any of the others[iii]. The important thing is to get inoculated, especially for the very young, the elderly, or those who risk serious complications from contracting influenza. Since 2010, the CDC has recommended anyone over the age of 6 months receive a vaccine every season[iv]. The vaccine isn’t just for your health—it’s for the health of those around you, too. You can potentially carry the virus to many people and spread it instantly, even without realizing it. And lack of symptoms is no indication of being clear, according to Harvard Health: 20%-30% of people carrying the influenza virus have no symptoms[v]. Every time you enter a public place carrying a strain, you have the potential to spread an illness. The first recorded pandemic of influenza was the 1918 Spanish Flu. It infected 500 million people around the world, including on remote Pacific islands. It is estimated to have killed from “20 to 50 million people”[vi]. The Spanish Flu pandemic was a very unique circumstance, and one that has, thankfully, not been repeated on that scale since. But every year, it is estimated that “36,000 people will die from influenza strains”[vii]. 200,000 will be hospitalized for the flu[viii]. Those most vulnerable have weakened immune systems, predominantly children and the elderly. During past seasons, approximately 80% of flu-associated deaths in children have occurred in children who were not vaccinated, according to the CDC[ix]. Given such statistics, why do people still not receive the vaccine? It isn’t just a fear of needles. Many people do not see the necessity of it, or have heard various myths surrounding the vaccine that deter them. 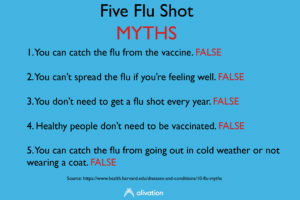 One large misconception is that you can catch the flu from the vaccine. This is false: the vaccine is made of inactivated strains that are not able to transmit infection. Those who got sick after receiving the vaccine were going to get sick regardless[x]. But the correlation is assumed to indicate causation, though it did not occur. Others will say that you don’t need a vaccine every season. But the flu mutates each year, so getting a vaccine each season is essential to inoculating yourself from potential outbreak strains, according to the Mayo Clinic[xi]. When you get vaccinated, you’re not only preventing potential illness for yourself, you’re also preventing illnesses that could prove life-threatening to those around you. If you’re a parent, it’s also one of the safest decisions you can make for your child and the children they associate with[xii]. Social illnesses like the flu survive and thrive by human contact with one another. It only takes a few not being vaccinated for a deadly strain to spread like wildfire. Preventing the spread of infectious illnesses is everyone’s responsibility. We at Alivation encourage everyone reading this to take the appropriate steps to safeguard their health, and the health of those around them. Little things can produce big results. If you’d like a flu vaccine, request one today. Alivation is always prepared to help you avoid contracting a potentially serious illness. Alivation doesn’t have corner offices and corporate suits. You won’t see a closed-off boardroom for VIPs only, or multi-storied buildings where the chief officers are walled away from the lower levels. Our CEO is Trevor Bullock, and his office is on the garden level, down the hall from People Resources. His door is always open. If you need to talk you can walk in or email, time-depending. The entire structure here is different than a normal successful organization. We like to say it’s been revamped. Trevor is homegrown. From Lincoln originally, he played baseball for UNL and was recruited by the Philadelphia Phillies as a left-handed pitcher. He played for 2 ½ seasons. He got his degree in Criminal Justice and Psychology, and a Master’s Degree in Leadership and Management from Doane College. He ran a local IT firm as their COO and landed them on the Inc 500/5000 for seven years in a row. Trevor worked for government and non-profit organizations for many years. He worked closely with adolescents in his roles, always striving for a culture of safety and protection. Through his work with Health and Human Services, he became acquainted with Dr. Walt Duffy and Premier Psychiatric. It would be a fortuitous association: He joined the team in 2015, and helped shepherd the transition to Alivation Health in 2017. He shared in the organization’s great passion for reducing the stigma of mental illness. The current that runs through Trevor’s life is one of passion and drive. He has a fervent moral compass guided by his faith and a fundamental belief in society and fellow humans. Every day, he walks Alivation for fifteen minutes and talks to team members, seeing how they are, getting a pulse on the prior day. But this isn’t micromanaging: his first goal is to select the most capable people, and then leave them alone to do the best job possible. It’s his signature leadership style. Why select the best if you don’t trust them? 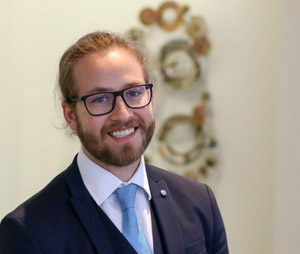 Innovation and collaboration go hand in hand, and Trevor’s knowledge of IT led him to not build a team with a single point of failure, and services that are all integrated. The whole is stronger than the sum of its parts. For the people of Alivation, Trevor urges them to trust the process, and believe in change and the inherent progress of medicine. The crucial leadership elements are trust and flexibility. One must remain nimble in an unexpected situation to adapt with the circumstances, and you must trust those around you with the outcomes. We’re all in it together, and we can all be better when we help each other. Speak your mind, help others, have the drive and passion to succeed on your best terms. Don’t be afraid of failure. Never settle. For patients and the larger community, Trevor urges them to have the same faith, to not ever settle for the mundane or the expected and to always care enough to challenge and be challenged in return. 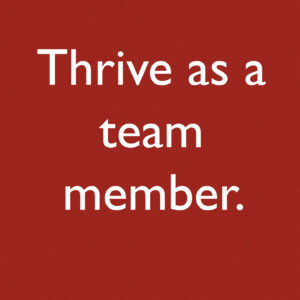 Survive versus Thrive is an easily settled dichotomy: always thrive. You’re worth it. Next Level You isn’t just a slogan, it’s a promise, and one we can all have a hand in helping to achieve. Trevor believes we’re all able to flourish together. This is where Trevor sees Alivation going in the future. Our trajectory is always upward, and our challenges are also opportunities. It’s an area Trevor relishes being in. He believes in being a center of excellence, and building a platform from which to give back. He trusts in the process that he urges others to trust in, and won’t let the familiar or routine overcome the necessity of exploration. It’s essential to ignore naysayers and to speak to the right in us that must be kindled. Alivation will grow by providing the best services possible, and by assisting others in joining that mission. We’re in the business of customer service. We normally refer to our customers as patients. But we’re celebrating Customer Service Week (Oct. 1-5), and highlighting the ways we serve the community and the people who come through our door. 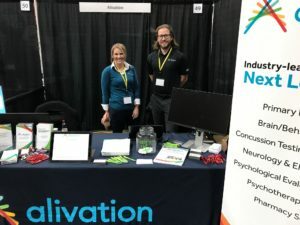 Many members of Alivation’s ever-growing staff has the word patient in their title. 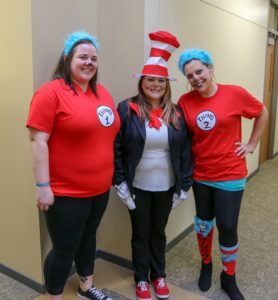 Patient Experience Coordinator, Patient Account Specialist, Patient Services Care Coordinator, Patient Service Specialist, Patient Navigator—any way you slice it, all these titles and the busy men and women filling them are in the business of customer service. Not a lot of places can boast so many resources and so much time devoted to ensuring a great experience. When you first enter the building, you’ll likely meet Jen, Leah, Huzaifa, Carlos, Ashley or Aubri first. They’re excellent at what they do, friendly and accommodating—essential traits for the frontline of service. We always want the patient to start by feeling welcome, and to meet people who are engaged and helpful. You’ll see smiles when you open the door. They’ll get you set up, find your information, or chat on the phone with incoming patients. No sweat. In addition to the front desk, Alivation commits to customer service by expanding our assistance reach in all three integrated affiliates. What does that mean? Simple: we’re available, and the divisions work together. 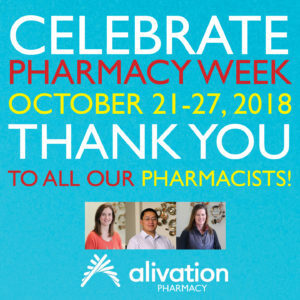 Alivation Pharmacy is not only a branded affiliate of Alivation, it is also a full-service pharmacy, able to fill scripts for patients’ family members as well. They have a free mobile app designed to make refilling your medications or keeping up with your prescription regimen a breeze. They’ll give out bubble packs for those who are on a series of medications—also free of charge. 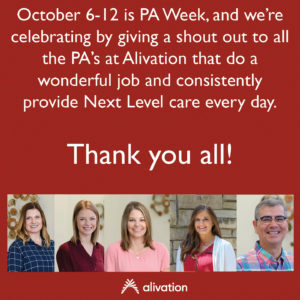 Alivation Health, our largest division, employs many MD’s and PA’s to care for as many patients as we can. If there’s one thing we hate, it’s a three-week wait for providing services such as appointments or refills. We want to see you this week. Dr. Walt Duffy, Alivation’s founder, president and Chief Medical Officer, is always booking it through the halls, happy to see as many patients as he can. He’s here early, leaves late. His driving mission is to always help, and he really listens when you tell him about your challenges. Alivation Research goes above and beyond, organizing studies and doing work with national significance. They helped test and develop the medication for tardive dyskinesia, and are always working on doing more. They listen closely to the patients and participants, provide for their needs—all to look forward to the treatments of tomorrow being developed today. Their customer service potentially extends many years into the future. What’s a better service than a new treatment option or a potential cure? The Culture Club in the basement, where these blogs are produced, is dedicated to not only reaching out to customers, but educating them as well. Our blogs, while we hope entertaining, are also meant to teach customers in a friendly manner. Our educational materials, such as pamphlets, handouts, cards or posters, are also dedicated to patients. We want you to know about our options, be they TMS, EEG assessments or DNA testing. We serve the customer by arming them with the information necessary to make the best decisions for themselves, and answering any questions they have, when they have them. 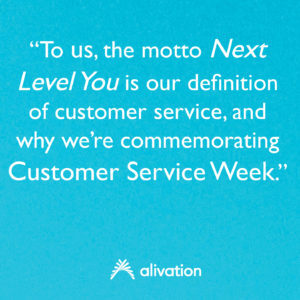 To us, the motto Next Level You is our definition of customer service, and why we’re commemorating Customer Service Week. We want to highlight exceptional service and what it means. We want to reinforce to our customers and our team members that great care is a great policy. Next Level You is a process, a conversation—we need you to partner with us, and we appreciate the opportunity when you let us help you. One of the most important topics is also one of the least understood: health insurance. We hear about it in the news daily; Alivation’s own educational materials are casually littered with the terms. But still there seems to be great confusion about it, and not everyone understands their options. Let’s demystify it all quickly. Premium: The amount you pay your insurance provider each month for coverage. Deductible: The amount you must pay out-of-pocket before insurance coverage begins. Coinsurance: The money you owe to a medical provider once the deductible has been paid. Co-pay: An amount, usually fixed, that you pay at the time of service. 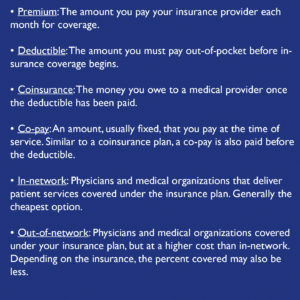 Similar to a coinsurance plan, a co-pay is also paid before the deductible. In-network: Physicians and medical organizations that deliver patient services covered under the insurance plan. Generally the cheapest option. Out-of-network: Physicians and medical organizations covered under your insurance plan, but at a higher cost than in-network. Depending on the insurance, the percent covered may also be less. 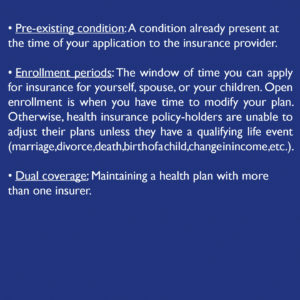 Pre-existing condition: A condition already present at the time of your application to the insurance provider. Enrollment periods: The window of time you can apply for insurance for yourself, spouse, or your children. Open enrollment is when you have time to modify your plan. Otherwise, health insurance policy-holders are unable to adjust their plans unless they have a qualifying life event (marriage, divorce, death, birth of a child, change in income, etc.). Dual coverage: Maintaining a health plan with more than one insurer. A large barrier to care for many people is the price of health insurance. According to recent data, 28.9 million people in the U.S. under the age of 65 are uninsured[i]. Private insurance coverage for people under 65 accounts for 65.4%, and public insurance under 65 is 25.3%[ii]. In 2016, 45% of the uninsured population said the reason they do not have coverage is because the cost was too high. Many people do not have coverage through their jobs, and those below the poverty threshold in states that didn’t expand Medicaid are ineligible for financial assistance[iii]. Studies have shown that people lacking health insurance have worse access to care, especially in preventative services or treatment for major health and chronic conditions[iv]. Alivation works with insurance providers and policy-holders together to ensure the best possible outcomes. We’re not strangers to feeling limited by available coverages. We believe that every service is essential in providing the best treatment for patients. From WebMD, people with chronic depression, for instance, often experience other comorbid medical disorders, some of them physical[v]. These disorders can be long-lasting, require years of treatment and medication. That can become expensive very quickly. We believe the cost of insurance shouldn’t ever be a barrier to treatment. Everyone deserves to live their best life. We do what we can. 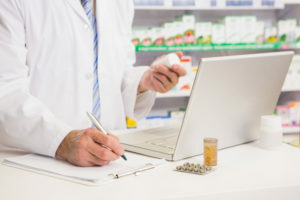 In addition to taking all major insurance, Alivation Pharmacy will call your insurance provider and search for discount offers to help with the cost of prescription medications, whenever possible. Doing this, they can find alternative medications, other formulary options, or in-house loyalty programs. We’re very open to working with you and your providers to get the lowest cost. We understand the system and are always happy to help. 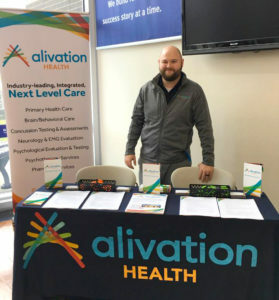 Every team member at Alivation, from the front desk to the CEO, is happy to help you with any questions you have about healthcare, coverage and options. Education is our best resource. At the end of this blog are resources you can use if you want to get into the specifics, or if you just want to learn more about the ACA and what your options are for coverage. Call us anytime if you have questions at 402-476-6060. It’s nice to be able to use the phrase “game-changer”. 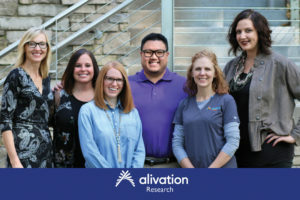 Not a lot of companies can say they work with people who are changing the world, but that is what Alivation Research does. 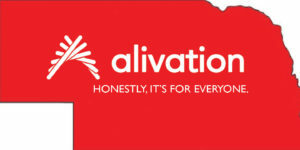 One of the three Alivation-branded affiliates, Alivation Research acts with autonomy as its own company, but also within the larger Alivation brand. Like the pharmacy or primary care, it wears many hats. This is where the Next Level You is made. So what makes Alivation Research a game-changer? They do the cutting-edge science that drives positive change. They conduct the research trials that make advances real. They recently helped carry out studies with other organizations for tardive dyskinesia, a disorder with involuntary, repetitive body movements. Because of their research and efforts, valbenazine, sold under the name Ingrezza, is now FDA-approved and available. It is also being studied for use in treating Tourette’s. Alivation Research helped make this treatment possible. It can take years for a medication to become approved by the FDA and make it to the market. Ingrezza did it relatively quickly. Alivation Research is much smaller than some of the well-known companies specializing in medical research. There aren’t massive facilities or faceless teams. The staff is small, less than ten, and they add a personal touch many other places lack. You get to know the researchers here. You get to the know the facility and the people conducting the studies. They’re open and honest about what they’re doing, and will answer any questions. Their passion for research is extensive, infectious. They will make you interested. They find study participants in a variety of ways. One way is through the website page, or through internet ads, such as on Facebook; they can be found in Alivation’s database as well. But one of the most important ways is through provider referrals—it’s reliable and efficient. Research does work in genetic testing, pharmacological, and technical areas. They studied TMS extensively, and still look for other uses of it. They all agree that many resources and techniques are ground-breaking, basically untapped. So much potential still exists and they’re only now scratching the surface. They’re currently finishing studies for bipolar disorder and smoking cessation, and want to work on studies for treatment-resistant depression soon. Kelly Espenschade, the Research Operations Manager, predicts Alivation Research only expanding further. They’re branching out into family studies and neurology, with specific work in diabetes, weight loss, and high blood pressure management. The benefits and uses are tremendous: Imagine a world with these disorders greatly reduced, or even eradicated. It’s a dream, but that’s how advances are made. The biggest things start with small steps, and even a product we take for granted today, say Advil, started with research. Vaccines started with research. Kelly envisions a company with multiple teams, with disciplinary studies and coordinators for each research project in the future. It’s safe to say Alivation Research will only continue trying to change the world, one small step at a time. With their focus on the new and the unknown, they can’t help but discover ways to treat patients that we haven’t thought of yet, ways to make people feel and operate better. That’s how innovations are born. Nearly 45,000 Americans, aged 10 and over, died by suicide in 2016, according to the CDC[i]. In Nebraska, the suicide rate increased by 16.2% from 1999-2016[ii]. Suicide is a challenging topic to discuss—in fact, it might be one of the worst. Which is why it matters so much. Suicide is a leading cause of death for Americans, and always leaves questions: Why? What were the signs? What was wrong? What could I have done differently to help? There aren’t easy answers for any of them. But it is essential to openly discuss suicide and its implications. That way, we can better understand why it occurs, who is at risk, and what we can do to prevent it. There are few among us who haven’t been touched in some way by a friend, loved one, or an acquaintance taking their own life. According to the American Foundation for Suicide Prevention, suicide is the 10th leading cause of death in the US[iii]. Among people between the ages of 10 and 34, suicide is the second leading cause of death[iv]. On average, 123 suicides occur daily[v]. There is no single established cause of suicide. It is often a variety of factors. Feelings of hopelessness or despair caused by health or stress issues is most common[vi]. Conditions like clinical depression, anxiety, or substance problems increase the risk[vii]. Depression often goes untreated in those who have it, exacerbating an already problematic situation. Often, those who are contemplating suicide may engage in risky behaviors, increase their drug or alcohol use, become socially isolated, become aggressive or irritable, sleep too much or too little, withdraw from family, and say goodbyes to friends and loved ones[viii]. Some environmental factors that might signal suicidal thoughts or desires are major life events or traumas, divorce, financial crisis, prolonged stress, rejection, or bullying. Psychological factors include depression, schizophrenia, bipolar disorder, traumatic brain injury, and a history of childhood abuse or suicides in the family. If the person has ever attempted suicide, the “likelihood goes up even more”[ix]. It may seem bleak. What can be done? The most important steps a person can take are recognizing the signs and putting themselves or the person in contact with a health professional. Therapy, medication, and a general support system are all possible aids to those contemplating suicide. Often simply talking about feelings and issues is a great place to start. Many just need to feel loved and heard by those near them. For those directly considering suicide and need immediate assistance, call the national suicide hotline at 1-800-273-TALK. September is Suicide Prevention Month, and September 9 to the 15th is National Suicide Prevention Week[x]. This is a great time to become educated about risk factors, symptoms, and signs. Just because suicide has touched all our lives in some way or another doesn’t mean the situation is hopeless, or change is impossible. The isolation can be overcome. It starts with the power of connection. It starts small and grows from there. It begins with telling yourself and others that you matter, that you are loved, and that the world is better if you’re here for another day. That’s what the sticker says on Elliot’s desk. 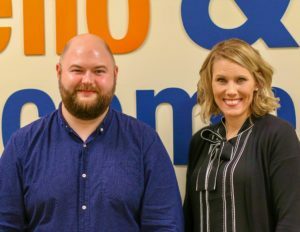 He’s the People Resources Generalist at Alivation, and along with Kylie Ensrud, Chief People & Compliance Officer, they form the entire HR department. No small job for two people to cover, and even here the credo of Next Level Care is practiced by all. Their prime philosophy is to not do policy-driven HR. We don’t even call it HR—we call it People Resources. You won’t find rule books, manuals, pages upon pages of the normal dry corporate material. They consider themselves safeguards of culture, and wear more hats than they can count. They believe they do it better than others. “No two days are the same” is the best summation from Elliott about his routine. Kylie is similar: sometimes she’s coaching and developing managers or team members, other times she’s going about the normal people needs of a company employing over 90 individuals. They both have a specific goal: to undo the stereotypes and drawbacks associated with conventional HR. They want to move away from bureaucracy, or the feeling of being the corporate police. They prefer to find what’s unique, what’s comfortable, what’s best for everyone—and then implement that. Alivation has doubled since January 2017, which has left them plenty to do in its wake. Such steady growth of both people and resources is only expected to continue, and possibly increase, over the next few years. Onboarding that many people to a new culture is not easy. They’ve made sure to equip each one of them with the tools to be successful. Elliott’s background is in music. He decided he didn’t want to spend 90% of his life in a practice room or on the road, and he loved working with people. HR called to him. He loved the idea of helping people, and especially of helping people to help others. 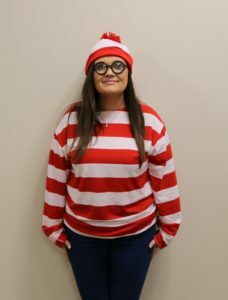 Kylie is currently a Ph.D. candidate in transformational leadership with a focus on neurocognition and social behavior. Their backgrounds are very different, but their beliefs in both transforming People Resources and in Alivation itself unite them strongly. Empowerment is a cherished theme. 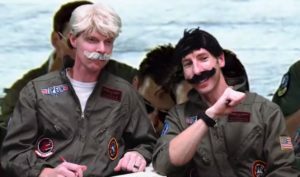 On top of People Resource duties and being people officers, they also plan the yearly holiday parties, help decorate the building, and do other tasks as needed. They’re frequently surprised each day by what they end up doing. The one thing Elliott says he hears more than anything else in People Resources is, “I can’t believe how nice everyone is.” They take great pride in that, both having come from companies in the past that didn’t care. They don’t believe in the phrase culture fit. They prefer culture add, highlighting that someone joining the organization isn’t molded to the framework, but rather adds to the framework itself and retains their unique personality. Skills and abilities always come second to character—they want passionate people who add to the culture. There is no checklist of traits to hit. 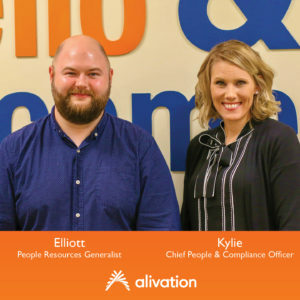 For those who look to join Alivation’s ranks, Elliott and Kylie say, they just need to think outside the box, not be afraid to be vulnerable or to share feelings, and to meet and add to our culture. We do things better, and we want members we select to be rowing in the same direction as the rest of the company. Alivation’s People Resources navigates the tricky waters between being the conscience of the company and the voice of the employees. It’s important the organization’s voice, values and methodologies come through, but it’s equally important that employees feel they can talk any time, and they will be heard. Projects always come second to people. No matter what Elliott’s working on, if you walk through the door, you’re his focus. If he doesn’t have the time, then he simply makes more of it. Elliott’s driven by a deep belief in people, and in helping them fit into an organization that sets itself apart from others. We’re a place you want to be from. There are three affiliates branded Alivation including Alivation Health, LLC (our clinical services), Alivation Pharmacy, LLC, and Alivation Research, LLC.. Of those three, the pharmacy acts with the most autonomy. It’s structured to be a third branch of Alivation, but also is an independent unit that can fulfill outside prescriptions—even for those who aren’t patients here. This allows it to service more people and fill more needed prescriptions. Behind the counter at Alivation Pharmacy you’ll find several friendly faces. Rachel is the pharmacy manager; she works closely with Brenda and Peter, the pharmacists, and Dawn, Emily and Rikki, pharmacy technicians. Part of what makes Alivation Pharmacy unique is the integrated approach it takes, as well as the convenience. They provide better care by collaborating with providers to ensure adherence. This also removes communication barriers by instant provider accessibility: they’re down the hall if questions arise. 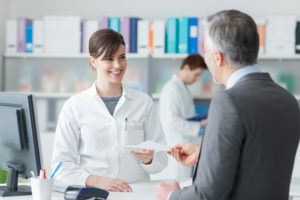 There is no disconnect between provider prescription and pharmacy fulfillment. The pharmacists can fill what are called bubble packs, separated bundles of medications listing doses and times to take them. They work great for children at school, or patients at day programs or in group homes. This service is offered for free. All medications can be filled on the same day, and the pharmacists will work with your insurance to clear the prior authorizations. They offer mail delivery for patients who can’t make the trip, free of charge, and text and email reminders for refills. They provide free medical disposal of medications. The pharmacists also search for additional savings methods for patients with higher copays. They hunt through manufacturer coupons, patient assistant programs, and sometimes do it the old-fashioned way and call the insurance providers directly. Doing this, they can find alternative medications, other formulary options, or in-house loyalty programs. 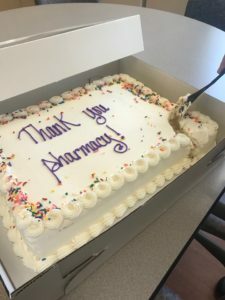 Patients have said, “No other pharmacy takes the time to do this for patients.” Recently, a new patient called just to say the pharmacy went above and beyond, and that he was thankful he switched to us. What’s more, the pharmacists care. Patients have often remarked how amazed they are that their names are remembered, as are other details. There’s a personal touch that other pharmacies simply lack. It matters. You won’t find Alivation’s pharmacists hustling you out the door as soon as they can. They want to chat with you, and they enjoy it. Getting to know our patients on a personal level makes their care that much easier and helps us advocate for them. On average, the pharmacy fills between 200-300 prescriptions daily. They fill bubble packets for about 90 patients a month. For a staff of six people, that’s a lot of effort, but the team makes it work. Another way they’re proactive? The app. Alivation Pharmacy has a mobile app downloadable on iPhone or Android. You can easily view your profile, customize preferences and set reminders, get text and email notifications when your prescriptions are ready for pickup, and access the pharmacy team. The free app is the definition of integrated care, working seamlessly with you and your pharmacists for the entire process to get you what you need, when you need it. They work with insurance companies and patients together, ensuring all medications are aligned and accurate. They call this medication synchronization. If our pharmacy goes above and beyond in all things, it’s because we believe in doing that for our patients. Every branch of Alivation lives up to the slogan Next Level You because that’s what’s best for patients. We don’t settle for halfway there, we go the entire distance. When most people think of traumatic brain injury (TBI), it’s what is seen on the news: concussions, predominantly from sports. Each year we’re deluged with articles about football head injuries, players suing organizations, and even a movie starring Will Smith, Concussion[i], about this topic. In less than two years, concussion settlements in the NFL hit $500 million[ii]. Is TBI, then, only an issue for professional athletes? It starts with recognizing what TBI is. The cause of TBI is a blow or jolt to the head and body. The main symptoms are headaches that get consistently worse, vomiting or nausea, slurred speech, weakness or numbness in arms and legs, dilated pupils, and in serious cases, seizures or convulsions. Symptoms may not appear for days or even weeks later. Sometimes there are rapid changes in moods or emotions. TBI injuries can lead to permanent brain damage. Recovery from TBI can be a long, complex process, and in severe cases will require rehabilitation. In the most severe cases, TBI can prove fatal. It’s important to remember that though concussions are the most well-known example of TBI, they are not the most prevalent. Half of all TBI cases are from motor vehicle accidents[iii]. Many times, TBI is the result of a slip or a fall, and often the person does not even realize they’ve had an accident that requires neurological attention. Even after the onset of symptoms, treatment is prolonged, or the person doesn’t believe anything is wrong. The dizziness, tiredness, pain in the head or neck is dismissed, not considered related to the fall. Domestic abuse victims also experience TBI, with the vast majority never receiving a formal diagnosis, according to The New Yorker[iv]. In the home, the causes of TBI are falls down the stairs or in the bath, down ladders or on slippery surfaces. Children are often susceptible to these types of incidents, making it crucial to be on the lookout for signs and symptoms. Motor vehicle collisions are a culprit for both children and adults. Sports injuries are extremely common in youths. For those in the armed forces, explosive blasts and combat injuries can cause severe TBI[v]. For preventing TBI in motor vehicles, the best options are seat belts, child safety seats, roll bars and airbags. In sports, softer baseballs are used to decrease the severity of possible head injuries, helmets are designed for lessening the effects of impacts, and rules are in place for preventing dangerous contact moves, such as “spear tackling”, that might directly cause injury[vi]. On playgrounds, shock-absorbing surfaces, such as mulch or sand, also help prevent injuries for falling children. Public health campaigns are also enacted to encourage safer actions in both children and adults alike. Still TBI happens. For example, in 2013 according to the CDC, there were approximately 2.5 million TBI-related hospital visits, and approximately 56,000 deaths from TBI[vii]. The rate of mortality was highest for those aged 75 years and older, with falls being the leading cause. This is clearly no small problem. So, when it does occur, how does Alivation treat it? At Alivation, we also use EEGs (electroencephalograms) and our Brain Health Monitoring system to record electrical activity in the brain. An initial EEG establishes a point of reference. This reference point allows your provider to compare subsequent EEG results, and equips them with critical data about how your brain is processing information. This helps us later in treating patients by showing them they’ve had an injury, and how it has changed their brain’s normal processes. We also do this to show how your brain is healing, so we can deliver the best care for optimal brain health. In many cases, patients do not realize they’ve had a brain injury until they’re shown the direct evidence of it. Despite noticeable mood swings, emotional shifts, headaches, and other outward signs, it is only with the assessments that patients can visualize what exactly has happened. Once discovered, the injury can be treated properly. TBI isn’t like a muscle or skeletal injury—it can take far longer to heal, and in some cases may never entirely heal at all. The financial burdens can be overwhelming, and for many, recovery is a difficult process. On top of the medical methods, such as scans and medications, therapy and emotional support are crucial. Alivation is the Next Level of care by offering those lines of support, and never losing hope. We encourage the patient to keep working, and we encourage ourselves to find new ways of preventing and treating TBI. It’s a simple principle: to know what’s wrong, you need to first know what’s right. In daily life, this is a principle we take for granted. For instance, we know that when it’s raining, it isn’t sunny, and vice versa. To establish a normal pattern is called a baseline. Seems easy enough, right? For the longest time, this was the goal in mental health as well. There was only one problem: How does one establish a normal baseline for a human brain? The answer is through EEGs. It is also helpful in monitoring for strokes, tumors, sleep disorders and head injuries. When Alivation uses EEGs for baseline assessment, we call it Brain Health Monitoring. It detects and records electrical activity in your brain. Using auditory stimuli to measure your brain’s response (recognizable sounds, tones, etc. ), our technicians administer the assessment. This aids in the development of treatment plans for our patients. It’s a remarkably clear, objective way to establish that baseline, and provide the best possible care. The actual monitoring process takes about twenty minutes. Application of the net, a series of nodes placed on the scalp for electrical measuring, takes around ten. 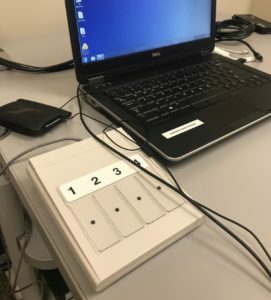 It uses what are called touch tones, where the person being monitored actively touches a button when they hear a certain sound. It’s encouraged that patients relax, try to control their blinking, and not clench their jaws. This helps monitor the baseline, and keeps the screen from difficulty picking up signals. The more relaxed and open, the better the results. The net used to monitor the brain is soaked for several minutes in a solution of salt water and Johnson & Johnson Baby Shampoo. They aren’t entirely sure why—something in the shampoo, and only that shampoo, makes the connectivity work wonderfully. Probably not what the makers of the shampoo had in mind when they manufactured it, but that’s one of those interesting side uses science discovers. When the net is removed, you’re free to go. After the assessment, the data is translated into 3D maps of your brain activity. This will help the provider build a specific treatment plan. Around two weeks after, you’ll be scheduled to review your results with your provider. This will help them provide that Next Level Care we promise to our patients—we believe in it. Dr. Duffy has treated countless patients this way, and the benefits are overwhelming. The ability to have a measurable scan of brain activity is very useful for determining when something is out of order. EEGs are an excellent way to see into something previously off-limits to outer eyes: the human brain. What could be more useful for mental and behavioral health treatment than a direct window into its processes? It’s called TMS, but that’s its official name. Now you can see why we call it TMS—it’s just easier to say. It has a large variety of uses: Depression, Bipolar Depression, Post-Traumatic Stress Disorder (PTSD), Anxiety, Parkinson’s, Tinnitus. For many patients with these conditions, and who have not responded to other treatments, TMS has proven extremely effective. It also has the benefit of being drug-free, noninvasive, and FDA approved. Alivation is one of the best—and largest—providers of TMS in the United States today. Dr. Duffy has been a leader in TMS, having treated more than 800 patients, and delivering over 24,000 sessions. One of the biggest benefits to TMS is the lack of pain. When people hear the treatment name, they assume it must at least cause a headache. It doesn’t. At most, some patients feel a mild tapping sensation, and possibly light pressure on the targeted areas after. Compared to the side effects that can be experienced with prescription medication to treat these same conditions, that’s a walk in the park. Each session lasts around 20-25 minutes, and the treatments vary from, on average, 31 to 36 sessions. There is no anesthesia or sedation, so you can drive yourself home after the treatment without worry. There is no pain. Alivation was one of the first to provide this service in the region. We started back in 2011, during the Premier Psychiatric days, and it’s been one of our core services ever since, and something we proudly offer. There are a variety of reasons for this, but the primary one is simple: it works. TMS has proven to be very effective, and the resulting positive life benefits for patients have been noticeable. In terms of Next Level Care, this is it. When we first became interested in TMS, it was still considered experimental. Now it is FDA-approved, with a host of peer-reviewed studies done by medical journals corroborating these findings, according to Harvard Health[i]. Of course, patients are always a little bit hesitant when they see the machine. It’s natural to be nervous for a new treatment. The machine cycles through pulses as it works; it sounds a bit like an AC unit. Over the course of each session, the machine will make various sounds, nothing particularly loud. Some patients have been known to find the experience soothing, and will actually fall asleep during it. They are woken up, however, as one needs to be awake during the treatment. It is also recommended to think about positive things, good thoughts. Patients who are optimistic, hope for a positive outcome and desire treatment are more likely to benefit from TMS. Those who make lifestyle changes concurrently with it have excellent benefits. There are four TMS machines at Alivation: three are in active use, one is in research. Alivation has regular appointments for use in all of them. Since 2011, the use has gone steadily up. Taeler and Tony, Patient Services Care Coordinators at Alivation, said the effect on patients is outwardly noticeable. Many will come in sunken, downbeat; by the end of their session cycle, they are more alert, friendlier. 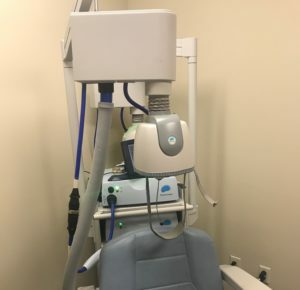 Many begin to view the TMS process itself as a positive experience in their lives, and enjoy the interactions with the providers and care coordinators. Alivation’s providers, in turn, enjoy seeing the patients’ quality of life improve so drastically. There are dozens like this, patients hobbled by depression freed from it. Many report better relations with friends and family, more hobbies, lifestyle changes, new jobs. One referred to themselves as “a productive citizen” who “found my self-worth” after. From a medical standpoint, these are the kind of things that keep us going. But when a patient says they felt they were failing at life, had no worth, fantasized daily about suicide, and then turns into an active, happier individual, the polar opposite to where they were when they started? Then that makes everything we do worthwhile. Lincoln is home to any number of medical complexes. Numerous mega hospitals, clinics, and other medical centers are just part of our landscape at this point, cultural and physical. You can’t drive a mile without seeing several dotting the eyeline; we all know people employed by them. The question becomes: if everything looks alike, how do you stand apart? What makes one facility pop out from all the rest? How can we be memorable? Alivation could go bigger, that’s an option. Start as a family clinic, end up with a helipad and fleets of vehicles with our logo on it. Fun, but not really the direction we wanted to go. None of us have pilot licenses, besides. So we found a different way. Rather than expand ourselves outwardly only, we expanded inward. We invest in people and technology foremost. Our size is always in response to our needs. We’re like a goldfish in this way, expanding to meet the size of the bowl. Our building is big, but we could always go bigger. There’s enough room in the Midwest for it, and Lincoln and the surrounding communities have demonstrated a need for our services over the years. Where there’s a potential need, we provide access. As a facility, we have the same sorts of conundrums many medical facilities do. We are sometimes faced with a massive influx of people needing care, and the ability to see them all on a timely basis. No one, least of all our staff, ever wants patients to wait for longer than necessary. We know this because we, the staff, when we’re patients for the doctor or the dentist, don’t like to wait longer than necessary, either. Doctors are also the fussiest patients, we should mention. There is the recurrent headache of the paperwork, which is a necessary evil. We need as much information as we can get to do the best job possible. We try to provide transparency, and we ask it of our patients and prospective patients as well. It’s one of those old rules we still value: honesty is the best policy. Early disclosures of signs and symptoms is the fastest path to recovery and optimal treatment. To better meet demand, we’re always selecting new providers, or looking for opportunities to work with other clinics. Growing pains are a side effect of rapidly expanding our treatment and service options. The old saying is “Fast, cheap, good—you can pick two.” We don’t bemoan success, and we won’t begrudge holding higher standards for ourselves and trying to have all three. We want patients to have access to the best care, as quickly and as affordably as possible. That’s the fundamental equation we strive for. Do we succeed at that? We think so, but we will never stop trying to do better. Whenever a family has had to wait too long in the lobby, we’ll improve that. Whenever patients need adjustments in their care, or they need to try something different—we work on that, too. There isn’t a day when we don’t consider needs. It simply isn’t in our company DNA to sit idle, rest, or ignore feedback and the opportunity to improve. We’re as active as we can be, and Alivation is always busy with people moving fast down the halls. All this counts toward our inward expansions, helps us be a better facility. We won’t leverage it into a beautiful but overly large center we don’t need, but rather utilize it into a place everyone is proud to call their own. When the time comes for patients to seek care, we like to be the ones they remember. It says Premier Heights on the circular road into Alivation—a remnant of a time before now. Emails still come in addressed to Premier Psychiatric, as do letters or phone calls and the like, and if you search Google you can find reviews for a clinic that technically doesn’t exist anymore. They’re all told the same thing: it’s Alivation now. The facility changed up, rebranded and expanded in 2017 to become what it is today. There’s no brainchild without the brain, and this facility leapt from Dr. Walt Duffy’s. He founded Premier Psychiatric in 1998, and since then it’s grown exponentially. 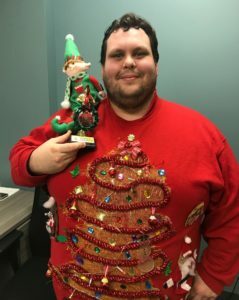 His family is on staff: wife Rosalie is an office assistant, and their children Will and Matt can be found plugging away in offices in the ground level, in offices adjacent to the IT department, across the hall from the CEO, and only a hall-walk from People Resources. The building is new, and the walls need more artwork as a result. It can be easy to get lost, as everything looks alike at the moment. 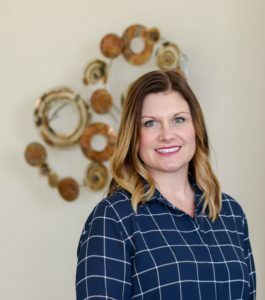 Kylie Ensrud, the People Person (HR), has been tasked with finding wall art to decorate, and she has her work cut out for her. Everywhere are signs the facility is young, but as the Duffy’s have learned over the years, growth can be sudden, unexpected. Blink and change will happen. Alivation is made up of three entities: Alivation Health, LLC, the clinical services, Alivation Research, LLC, and Alivation Pharmacy, LLC. They all work together, distinct LLCs but synchronized and integrated. 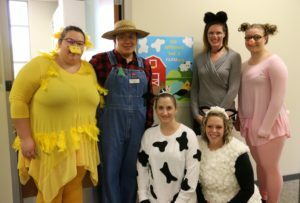 If you walk down the halls you see their staffs interacting all the time, holding doors for each other or patients, having lunch together in the shared breakroom, or maybe just laughing as friends. There is structure but not hierarchy. Dr. Duffy, always busy with patients, is a frequent sight roaming the halls, on missions. Need a chair or a desk from storage? Rosalie can hook you up. 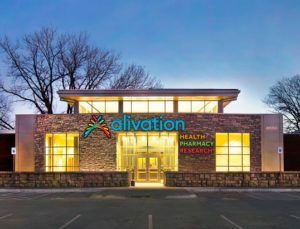 Alivation’s motto is “Next Level You”, but there is less sloganeering than you might think for a newly-minted outpatient facility. All the staff live by that motto here, but autonomy is prized, the ability to do your job to the best of your abilities and set your own loads or schedules. That’s more than sufficient, so dedicated are the staff to their duties. It makes inspiring hope and creating new possibilities that much easier. That sort of atmosphere, one of independence and ability, flows from CEO Trevor Bullock. He believes in it, and it makes others believe in it, too. Given this burgeoning culture and the changes associated with rebranding, the difficulties of all those name and stationery changes, the question becomes why do it at all? The biggest reason is the kind of problem that’s good to have: success. Premier Psychiatric proved wildly successful in its almost twenty years of life. Purchasing new facilities and starting research and pharmacy divisions was a natural outgrowth of this success and was a way to cater to patients directly and do everything in-house. We just prefer control—it makes for better service. You can receive a script from a doctor and have it filled just a few feet away. The old problems of driving across town for separate but interconnected services do not exist in Alivation. The research division is one of those fascinating places filled with quiet people always thinking. If you ask them, they’ll tell you what they’re up to, what they’re interested in, and what other facilities across the world are doing. If you press them, they’ll be happy to go into great detail about their research and will subtly reveal the great passions that drive that sort of thinking for tomorrow’s world. There is both an urgency and an excitement that permeates the talk. You won’t escape without learning something new. One of the outright cooler features of the facility is the use of dry erase walls. Most offices, and the main conference room, employ this system. It is simply a wall painted with dry erase board material, and it matches the rest of the room you’re in—you don’t even notice or think anything of it until someone uncaps a dry erase marker and begins graffitiing their thoughts, or drawing charts, or listing facts and information right on the wall. Staff often leave humorous messages in other peoples’ offices (that might be the best perk of the system). It’s much more convenient than conventional dry erase or chalk boards and allows the free flow of thoughts from people who have many of them a day. There is no time to be limited in expression. All these facets brought together form Alivation as more than just a clinic, or even a company—it’s an idea. The idea of doing better, of not being afraid to trip over your own feet running to the exciting future. 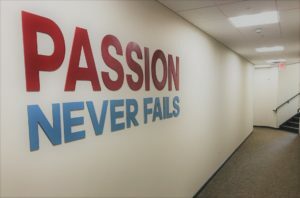 It’s a facility driven by passion, which has carried over from the Premier Psychiatric days, and everyone who works here shares that sort of vision and believes that the betterment and increased wellbeing of people will be developed and implemented by people. Like the company, these things are intertwined perpetually, and they work in tandem. It’s right there in the name: Alive + Innovation = Alivation.